That’s a combined total of 1122 years of war. It is just unimaginable. Their history is way too complicated and way too complex to understand or to even try to explain. But what is clear is that this is a country whose people have suffered a lot. And they have suffered badly. Remnants of these atrocities remain scattered across a few key museums…some of the only sights to see in the city. This is even depicted in their flag, a daily reminder of what Vietnam stands for. The ominous red background, a symbol for the blood shed during these many years of war. 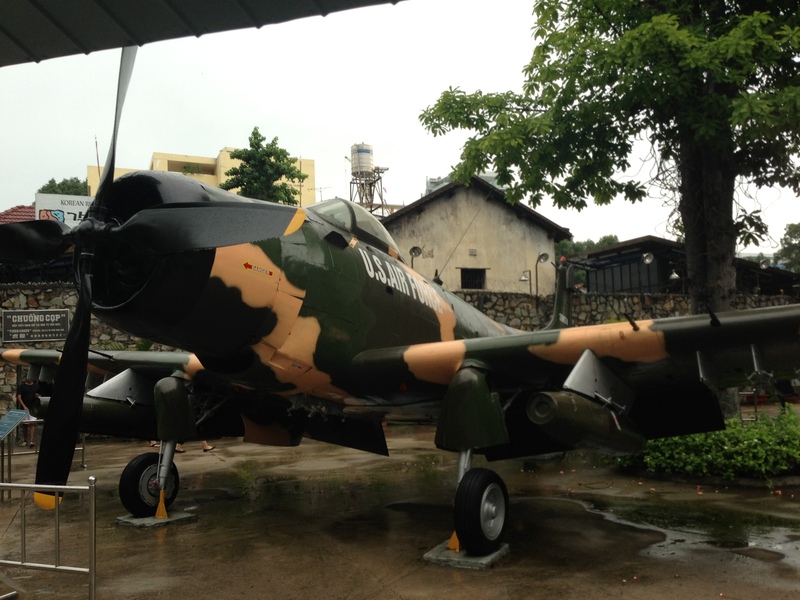 The star, a symbol for Vietnam’s ultimate victory; its yellow color representing the color of the people. Despite these unfortunate happenings, people seem to have moved on. The youth happily sip Starbucks lattes and the elders go about their business. Life has advanced. As it should. The streets are busy. Businesses are booming. Restaurants are full. And high rises are scattered across the landscape like confetti. But the history is unforgotten by no-one, especially the older generation. 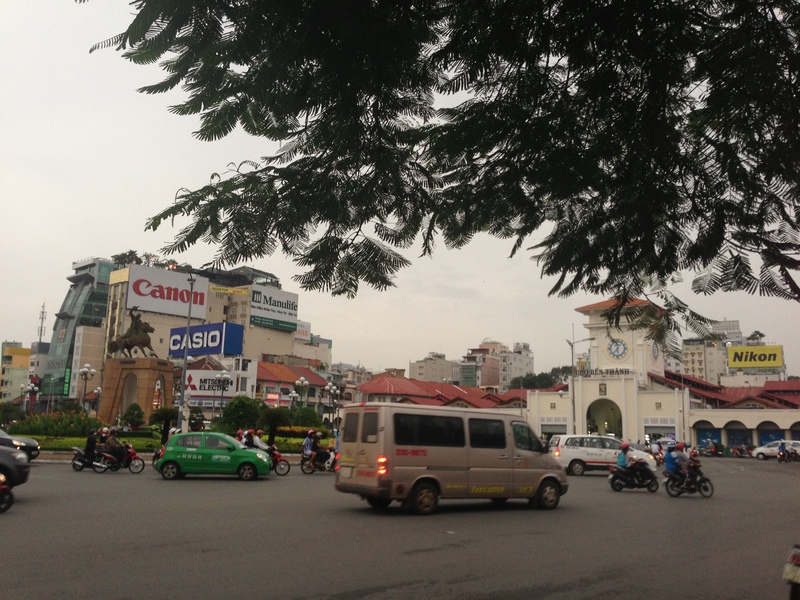 I returned from HCMC feeling slightly troubled. I say this because it’s rare that I visit a new place and leave unchanged or unaffected somehow. 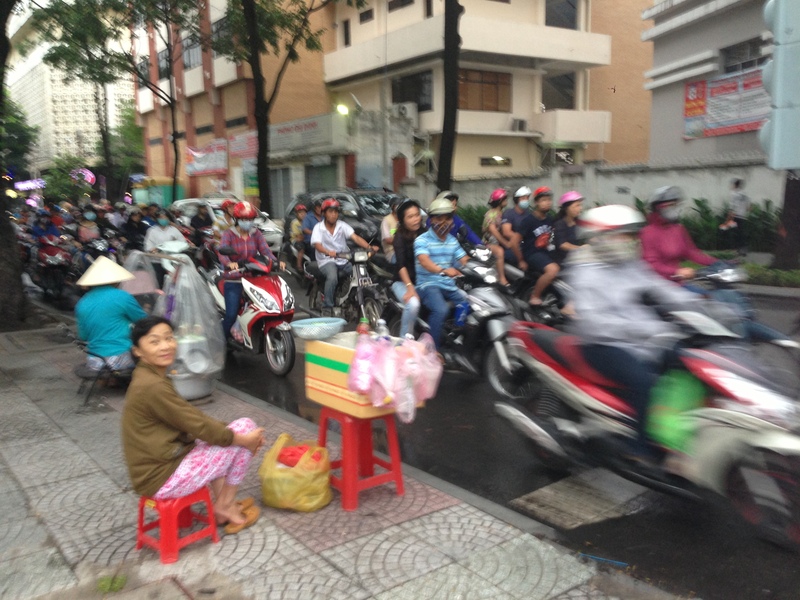 Despite an obvious sadness for the peoples suffering, HCMC, as a place, did not move our hearts like many places do; and we are very easily moved. It left no lasting impression on us. If I have to be completely honest, I would even go so far as to say we were disappointed by our first trip to Vietnam. 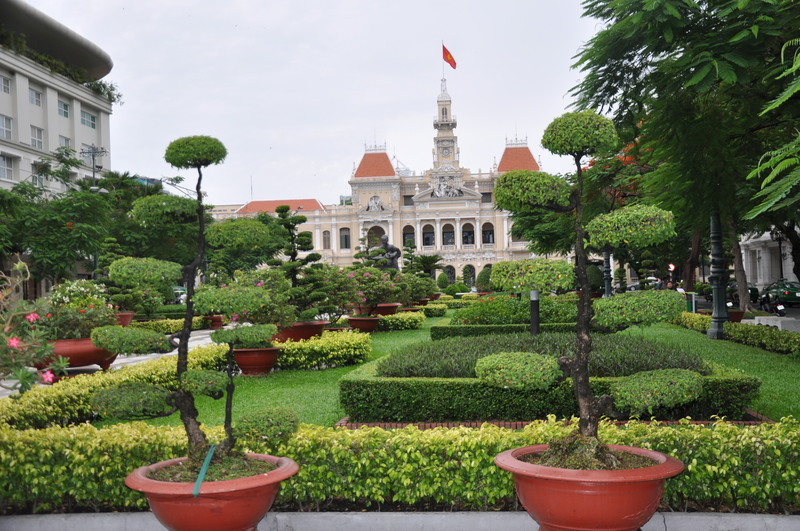 We didn’t find HCMC representative of the images we had grown up associating with this remarkable country, nor did we feel that we experienced its soul. Except for the 1st district (among 24 districts), we found the city lacked character and charm. Perhaps our own expectations were somewhat to blame as we were expecting to see more French influence or colonial charm by way of architecture, infrastructure, food and dress. Flashbacks from Michael Caine’s The Quiet American and travel programs I had watched zoomed past my grey matter as my confused brain mentally scanned the databank of memories, images and associations I had built with this country over time, futilely trying to match it to what lay before my eyes. Movies are hardly the benchmark, I know, but the city lacked an identity in our opinion, and we tried very hard to look for it. Crossing the street was like playing a game of live Frogger. Do you know that computer game from back in the 80’s? An innocent little froggy tries to cross the road with all sorts of mad traffic coming at him at varying speeds. That’s what it felt like. We each almost got hit at least 6 times over the past 3 days! It was absolute madness. Not a single car or motorbike stopped to let us pass, instead, swerving around us as if inconvenienced by our mere presence. Mind you, this was the case whether the “walk” sign was red or green. There is no safe place from motorbikes. 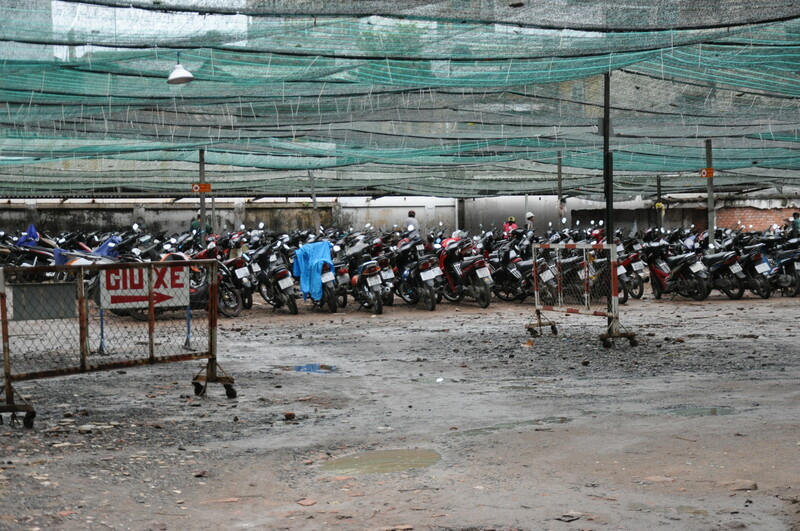 Except for district 1, even the pavements were infested with these 2-wheelers. Just standing on the side of a pavement was a feat, motorbikes zoomed everywhere, on and off pavements, zig-zagging 1/2 a millimeter away from us. When there was no motorbike action on the pavement, we had to dodge those parked back-to-back, forcing us onto the road to bypass these bulky “side-walk blocks”. It was really something else. And don’t get me started on the pollution. 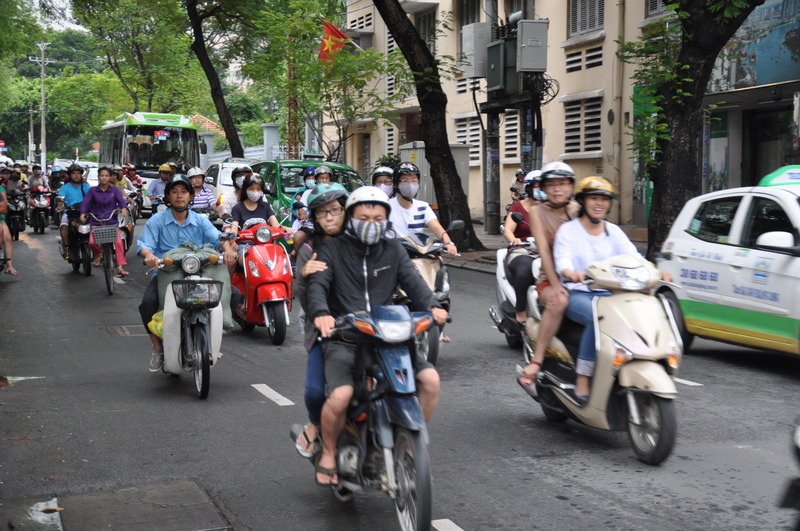 We were happy to see that most motorbike drivers wore surgery masks. And helmets. They were concerned for their own safety at least! 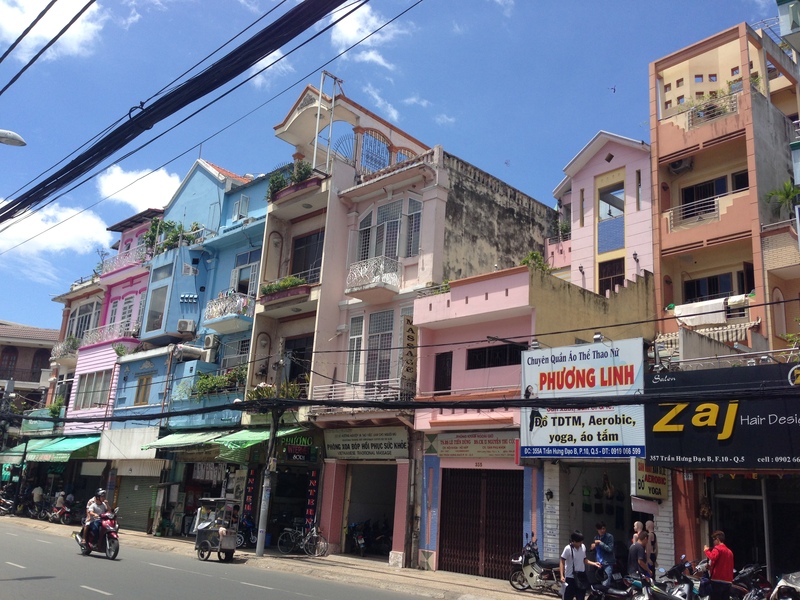 I apologize in advance if I have painted a bad picture of HCMC. Everyone we spoke to before we left had great things to say. And we certainly had our share of fun. 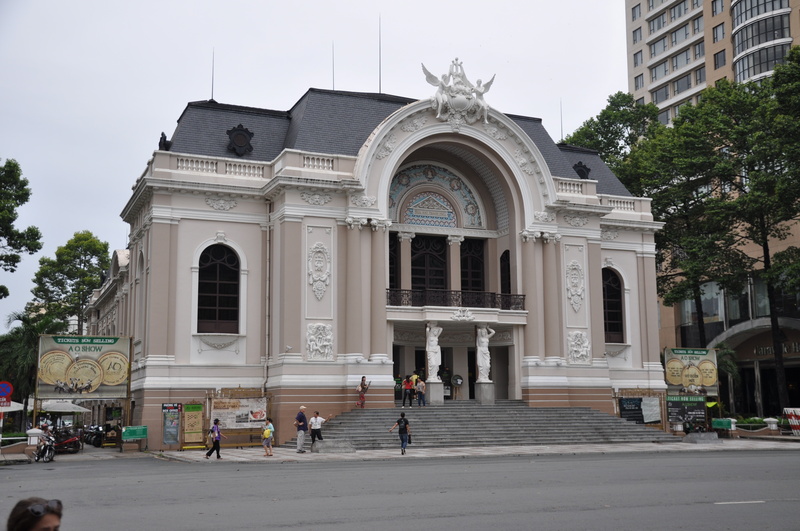 But culture is something we crave and the inability to grasp it in HCMC frustrated us somehow. 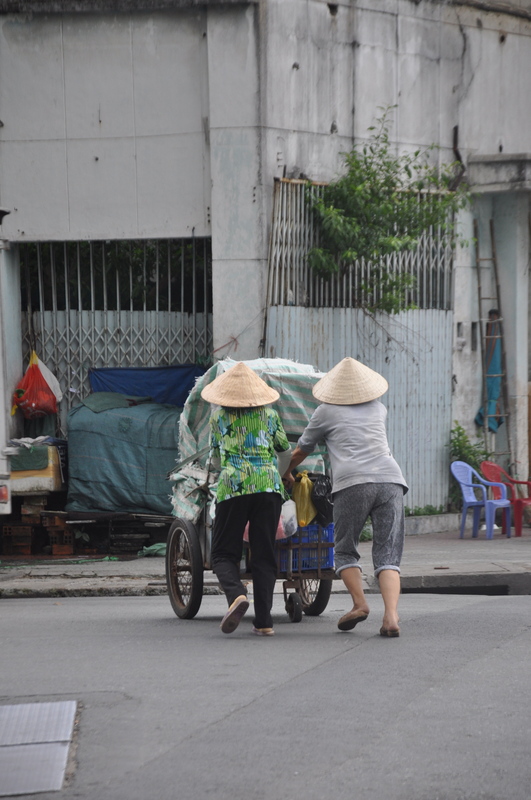 Except for the occasional Vietnamese hat, we could have been in any large city in the world. There was definitely some great stuff however as is the case absolutely anywhere on earth. What few people we met and spoke to however were wonderful. We walked a lot and did everything we could do in the city. You can find a more detailed snapshot in the tips below. 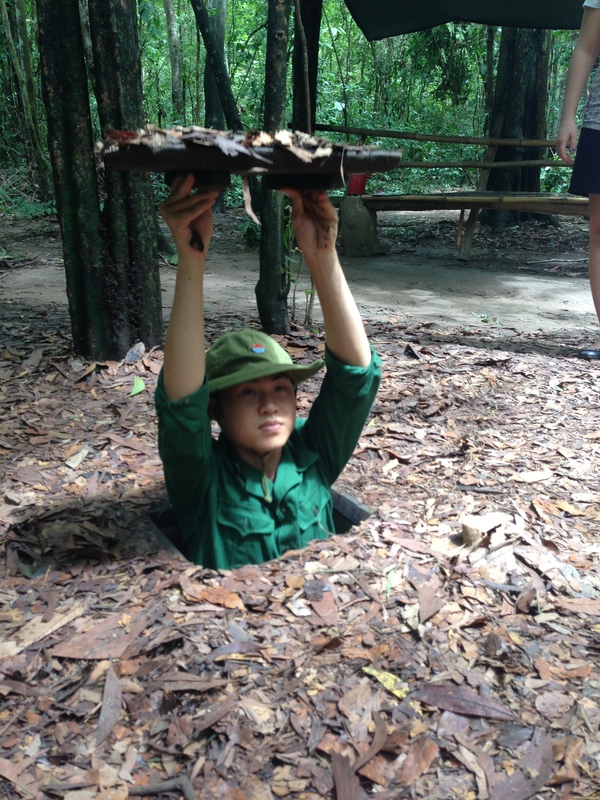 We had three main highlights: First, our visit to the Cu Chi Tunnels was absolutely unforgettable. 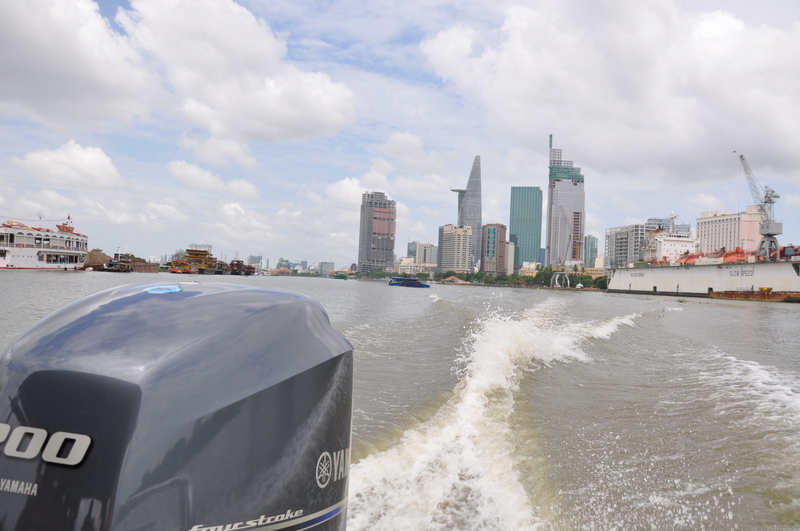 We took a speed boat to get there and back, had a wonderful lunch by the Saigon River and had an excellent guide who explained the in’s and out’s of how and why this elaborate tunnel system came to exist. In the case you haven’t heard about them, they run 250km long, on 3 levels that are up to 10m deep. There was no design plan when the digging began during the war with the French but it evolved, with need, over time and became a shelter during the war with the Americans, serving as a place to hide, live, study, get hospitalized, cook… it’s incredible. We walked past plenty of hidden entrance doors, teeny tiny spaces wide enough only to fit one thin person. Some travelers in our group were brave to try it; it was too claustrophobic for me! They even built trap doors for the American soldiers, out of bamboo sticks and the remainders of the shells that were dropped on them; they created ventilation holes so minuscule, they were unnoticeable, it was an unplanned stroke of genius. It was impressive walking through the forest imaging how terrifying life must have been like for them at the time, witnessing the size and impact of a crater bomb and contemplating the idea of a whole life lived underground. Unmissable. The second highlight for us was definitely the food! This is food capital! We had some great tips and ate very very well. 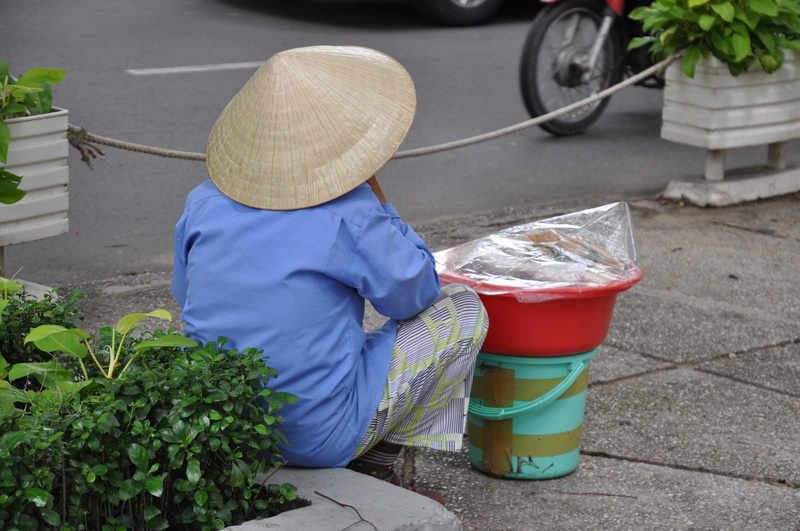 Vietnamese food is fresh, flavorful, green and full of herbs. It’s light, healthy and delicious. 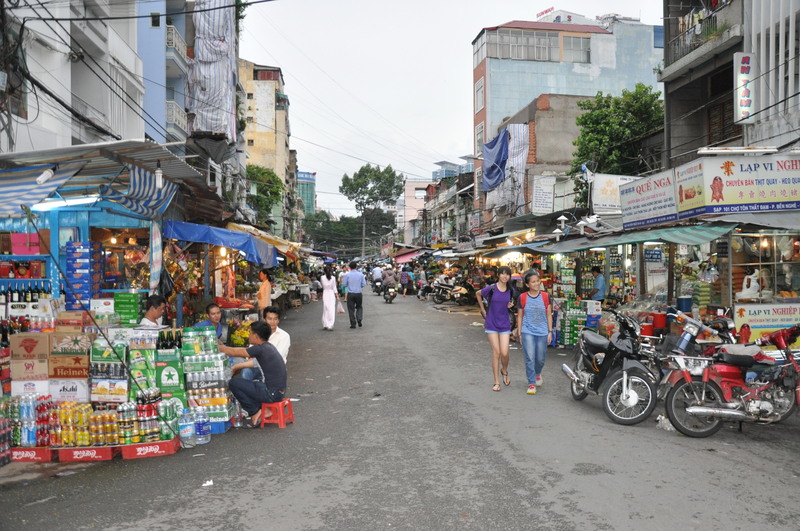 We didn’t have a chance to try any street food, which is recommended, but what food we did eat, we enjoyed tremendously. The food and night scene is advanced, trendy and diverse. Plenty of options and you can have a really good time if you are a food obsessed traveller like me! 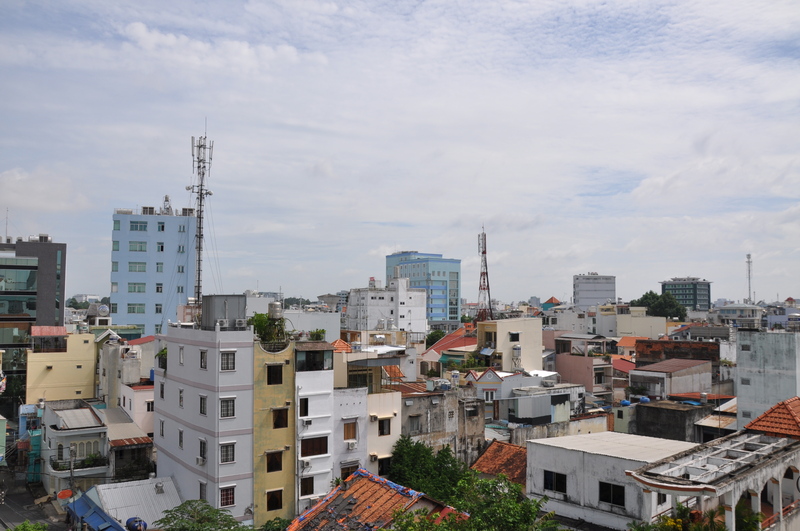 The third highlight for us was seeing HCMC from above. 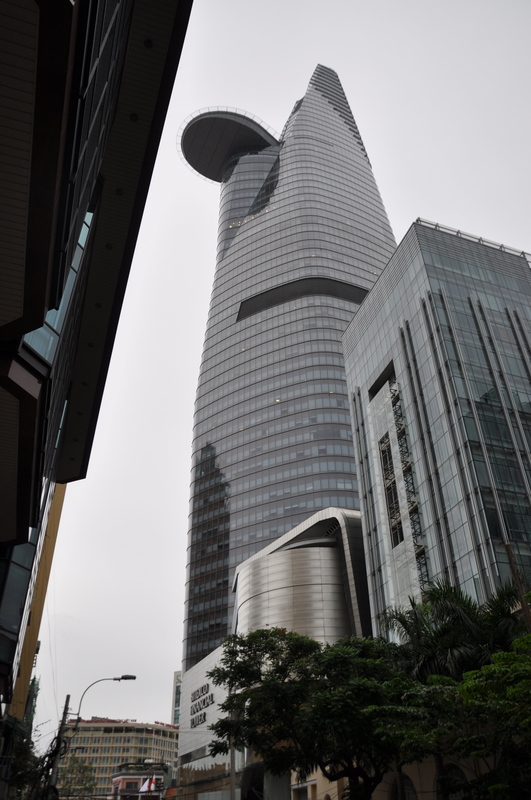 We visited the tallest tower (Bitexco Financial Tower) and took a speed lift up to the 49th floor where we enjoyed 360 degree views around the city. This gave us a perspective we didn’t have being on the ground. 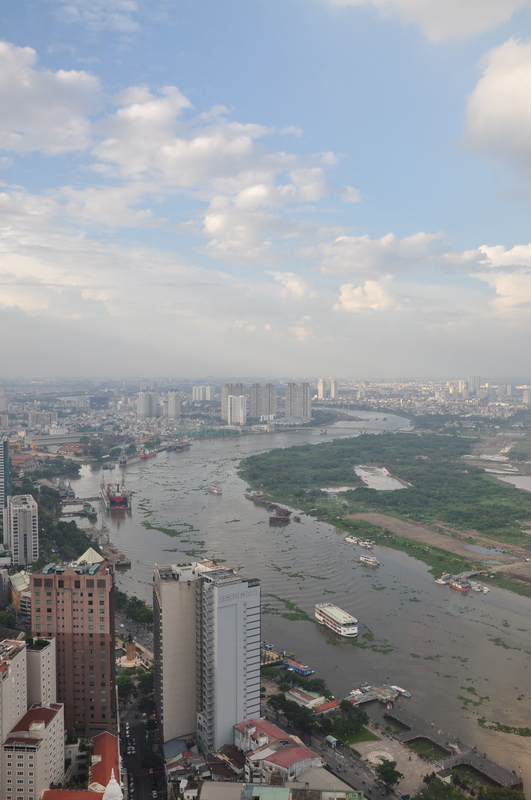 It allowed us to appreciate how big the city really was, to see the mad traffic whizzing below us like colonies of tiny ants and to see how the Saigon River snakes its way through, dividing one bustling part of the city from another. We then went up to the Sky Deck. Beautiful space for drinks and dinner and a real escape from the manic streets of the city. Adorable boutique hotel set outside the city center, a mere 10-15 minutes by car. 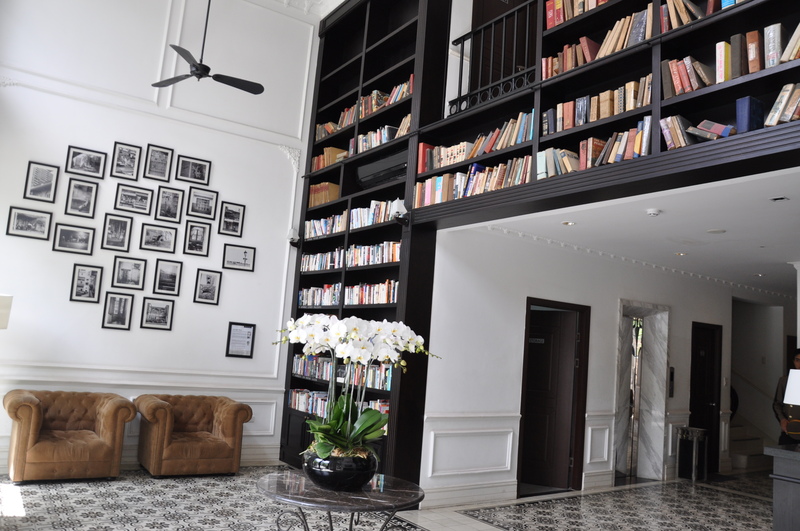 You are welcomed into the lobby of the hotel through the library, a very warm and homey welcome away from home. The beautiful tiles, photo gallery and floor-to-ceiling bookshelves had me at hello. The hotel was functional, the rooms roomy and well equipped. 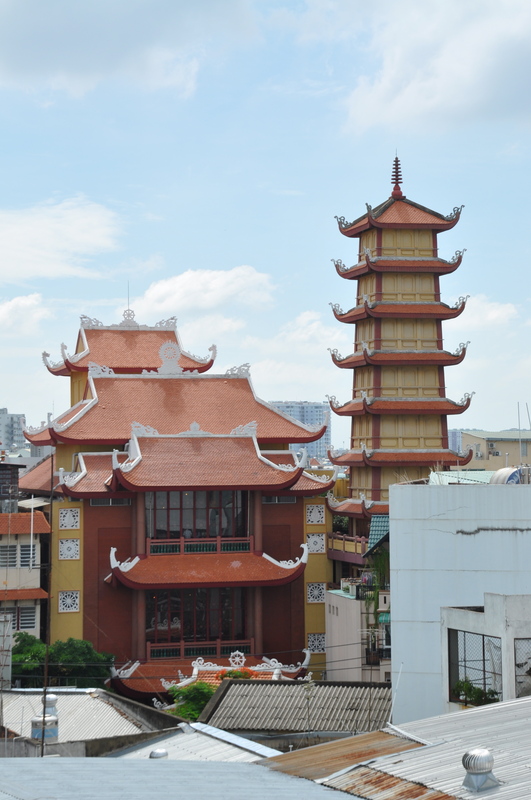 The breakfast was wonderful, set in the American style diner (Roadhouse) on the 5th floor with views overlooking the rooftops and pagodas of HCMC. A great option if you choose not to be in the center of the hustle, bustle and action. 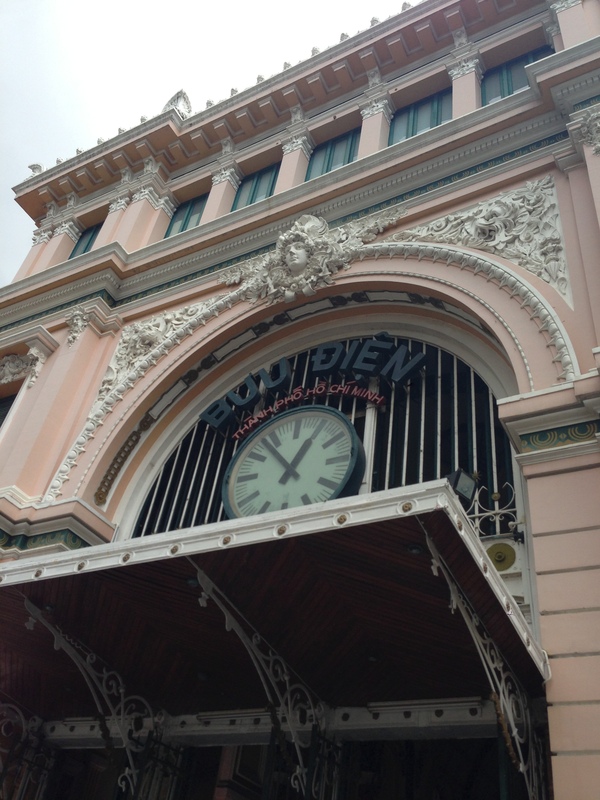 Recommended itinerary: This list is certainly not comprehensive but outlines what we did. 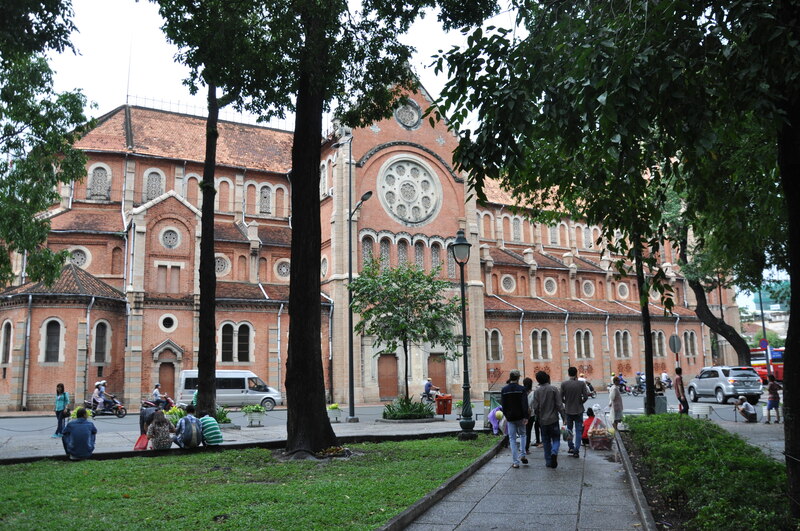 We thought two days was the perfect amount of time to discover HCMC. 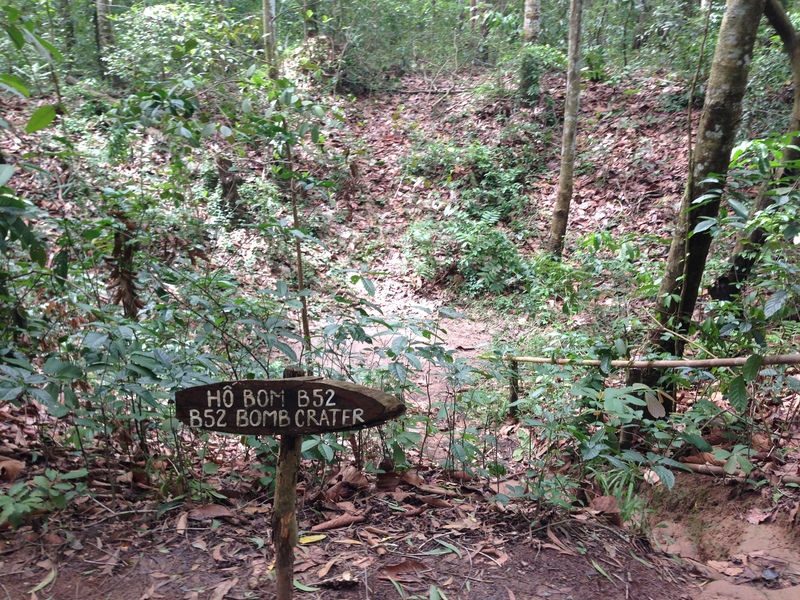 The extra day was great to venture out to the Cu Chi Tunnels. 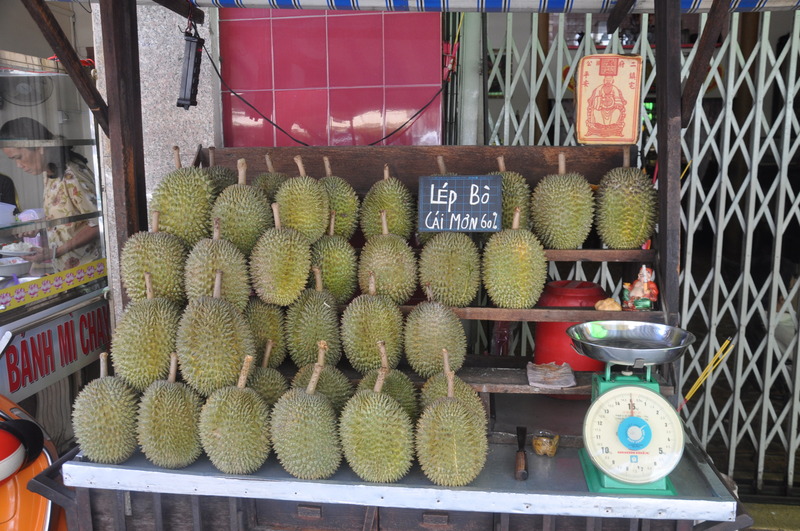 There are also excursions to the Mekong Delta and the Can Gio Mangroves for those staying a little longer. Make sure you book in advance though, we missed our chance to visit the mangroves, which I was super excited about for the monkeys and crocodiles. C’est la vie! 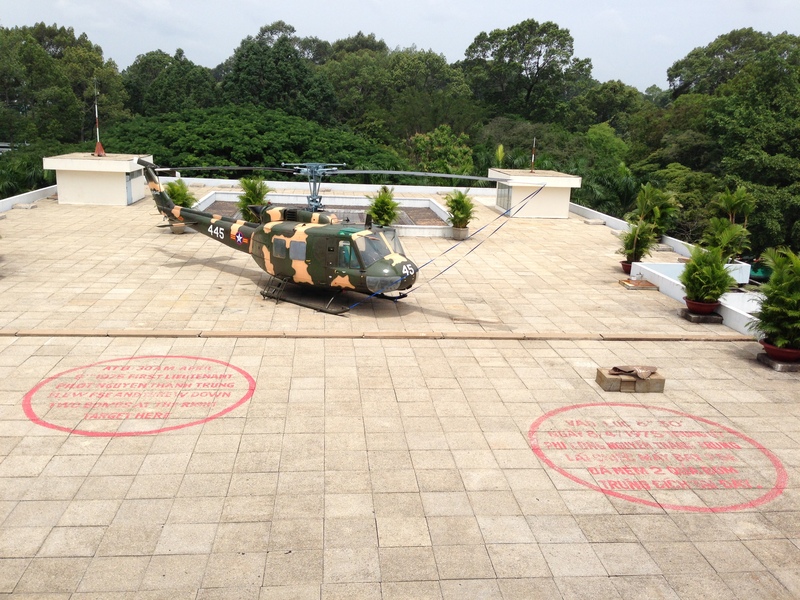 Reunification Palace – one of the main highlights and a great starting point to understand the history. ask for a guide, it’s worth it! Bitexco Financial Tower & Sky Deck – worth the $10 a head. Spectacular eagle-eye views over the city. The Sky Deck is just lovely for drinks, dinner or dessert! 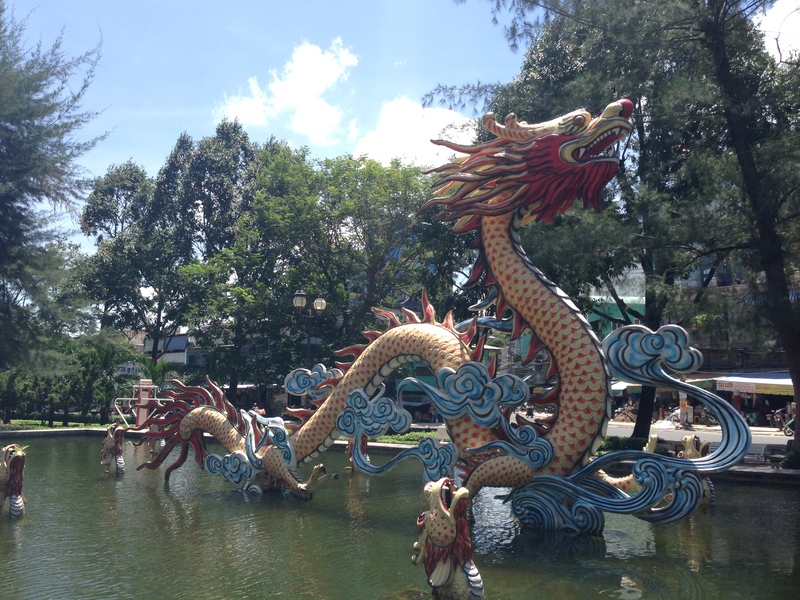 Cholon (Chinatown) – this didn’t feel like Vietnam at all, expected I suppose. 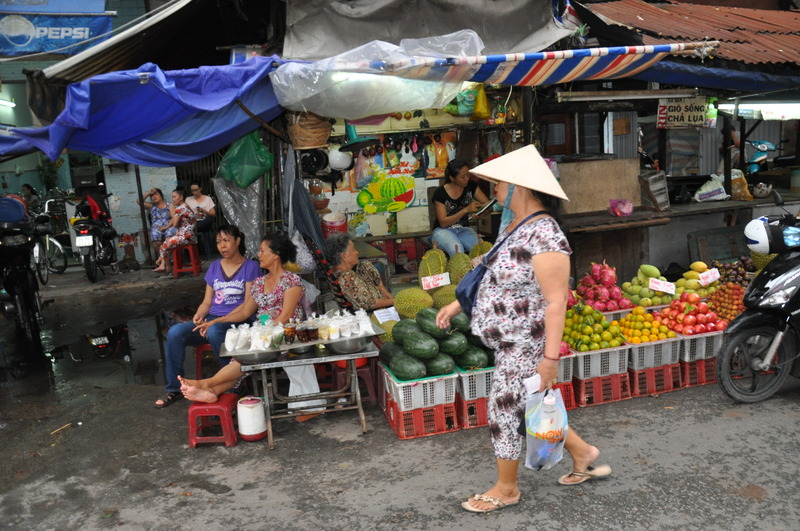 Crowded but interesting for the temples and local market (Binh Tay market) with a garden courtyard. Beware the overpowering smells of dry fish and shrimp. Gag-worthy for me! ) : It is a wholesale paradise for everything, they also sell to individuals. I walked away with some adorable cupcake liners! 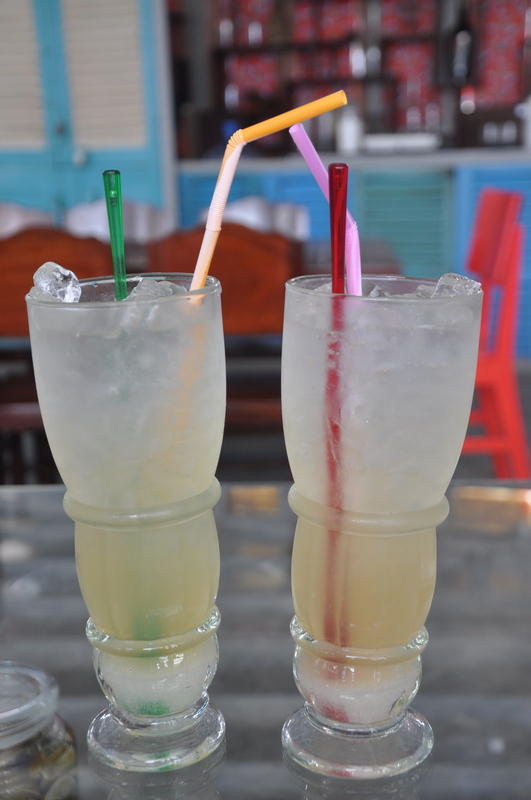 Cuc Gach Quan – the best food experience we had during our stay! 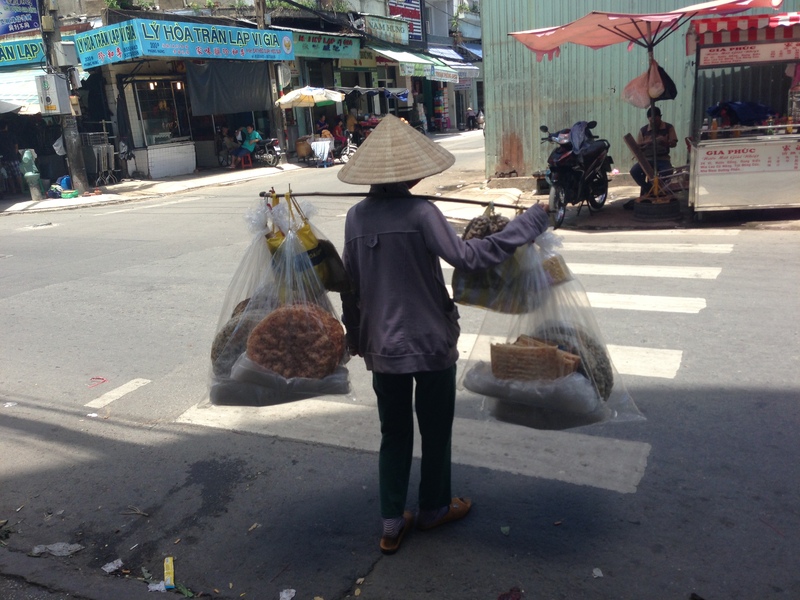 Modern Vietnamese. Delicious food, excellent knowledgable staff, we ate our tummy space away! L’Usine – cafe come lifestyle store. A must! What a fun experience, and super cool store and employees! This fledgling blog is only 2 months old and has a mere 10 followers but it has already been nominated for a Liebster Award thanks to the lovely and talented super young Sofia over at The Baking Owl. Thank-you again Sofia! I hope that this baby blog of mine can grow bigger and faster very quickly! 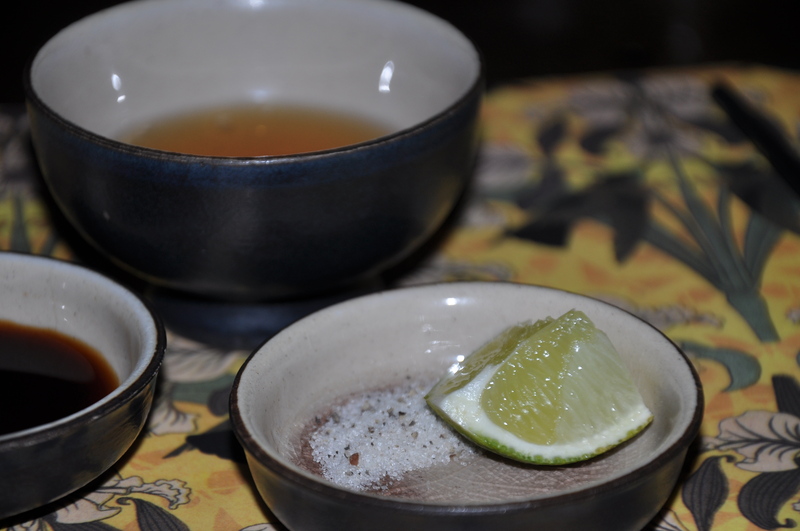 I am really enjoying cooking, baking, traveling and sharing my adventures with you; and I hope I can entertain and inspire you as much as your blogs are entertaining and inspiring me. Favorite holiday and why? Thanksgiving without a doubt because of the meaning behind it and because it’s a holiday shared by everyone regardless of religion, background or culture. The fact that you get to eat pecan pie, apple pie and enjoy the Fall doesn’t hurt either! When did you start writing your blog? April 7th 2014, it’s still a baby! Who is your life aspiration? Why? What one word in your opinion defines a “good” person? Favorite city in the whole world? If you could change one thing in your personality, what would it be? Why? 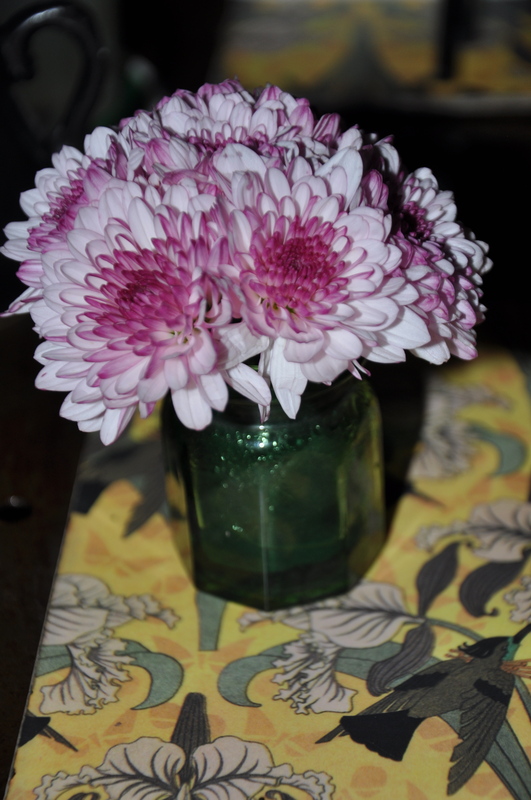 Thank-you all so much for reading! Never in a million years did I imagine the words “Indonesia” and “coat” would fit in the same sentence. I also never imagined I would one day be able to say that I waded through rivers and climbed rocks to be rained on by a massive waterfall; or that I hiked up an active volcano wearing 4 layers and rode a horse across the plains of a volcano crater kicking up a tornado of ashen dust behind me like a cowgirl in a western flick. A massive country that offers a countless number of options and surreal diversity by way of nature, people, language, food, weather and activities. Did you know that Indonesia is made up of 17,000 islands, only about 8,000 of which are inhabited? Neither did I. This was an eye-opening trip for me and one I will never forget. Java is one of Indonesia’s most important islands because the capital sits here. Let’s be clear. 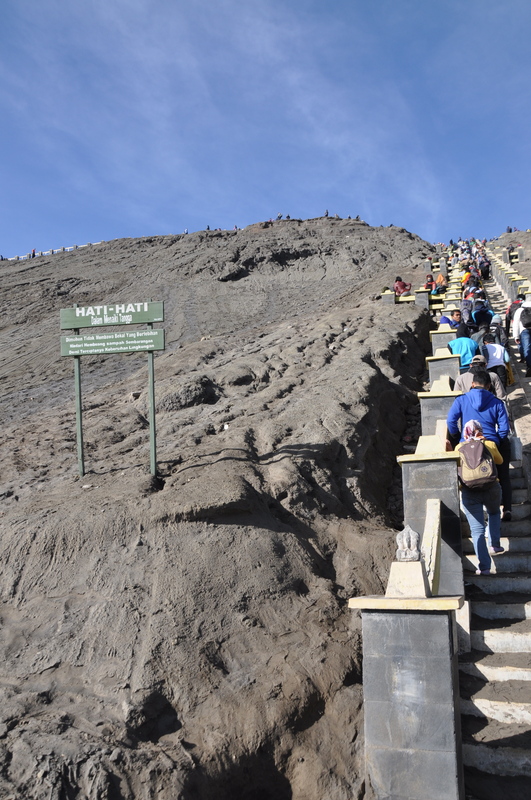 People visit East Java for one main reason: to climb the two most famous volcanos. 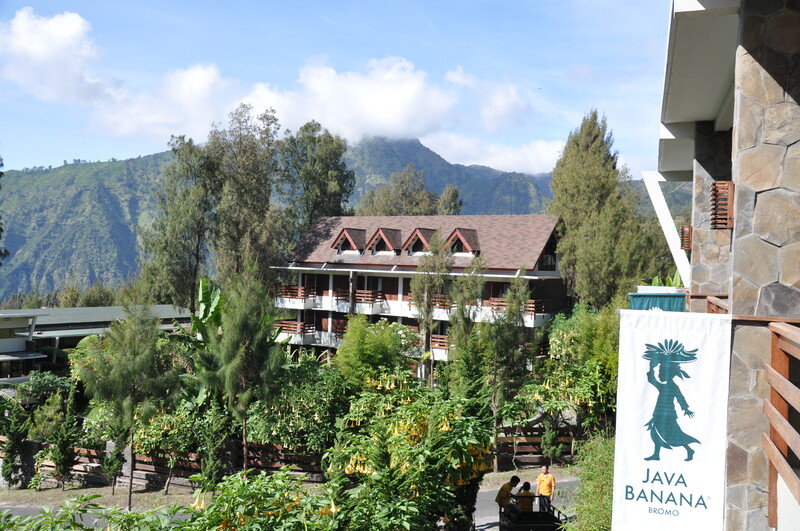 A visit to East Java is not a restful one if you want to do it right. It’s certainly not a holiday. 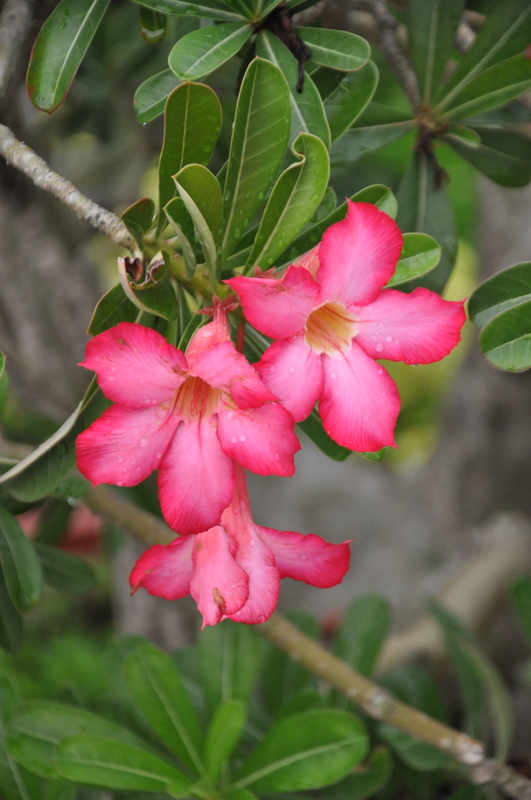 And despite its close geographic proximity to its sister, Bali, it cannot be farther from it in every way. East Java is adventure. It’s very early wake-up calls. It’s a lot of transportation. And it is supernatural beauty. It will take your breath away. And it will reward you in so many ways. Unless you live in Asia, such a trip would require major planning and at least a week off work. 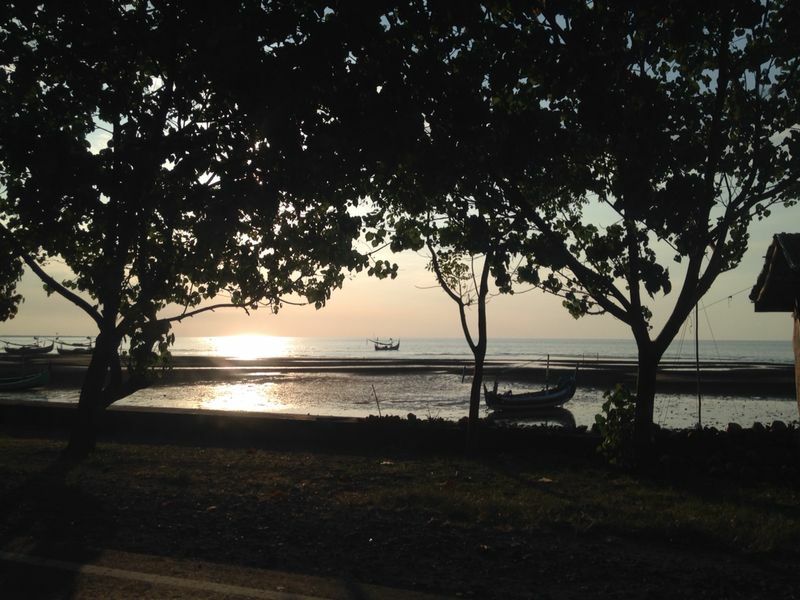 We took one day off and bundled it up with a weekend for 3 days of sheer exhaustion, plenty of time on the road and magnificence; moving from the most eastern tip of the island in Banyuwangi to Surabaya on the northeast coast of the island. 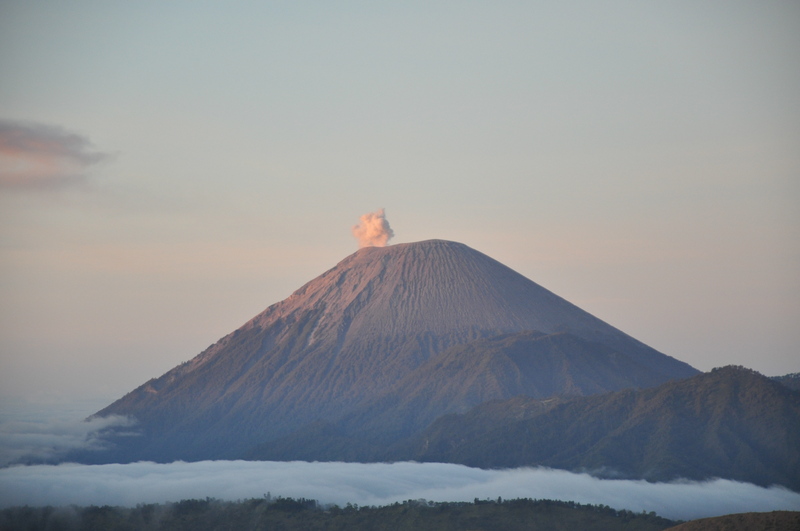 There are a few airports in Indonesia but getting to the volcanos limits your options. 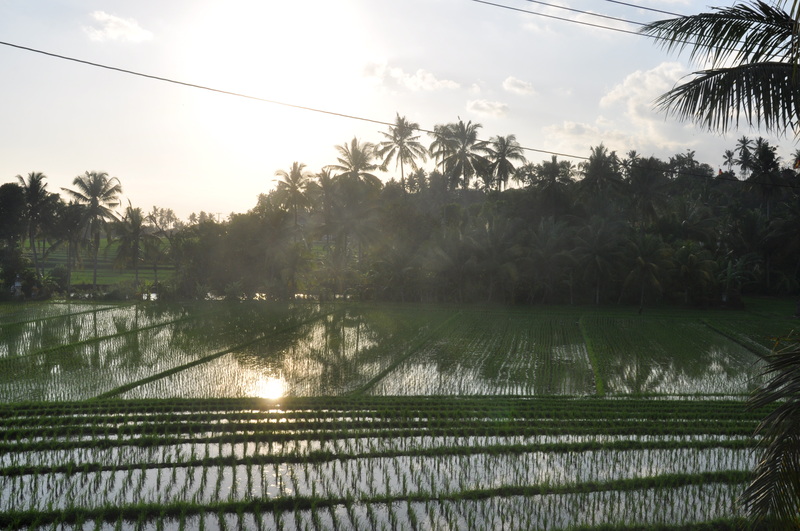 We chose the following route: Bali –> Banyuwangi –> Mt. 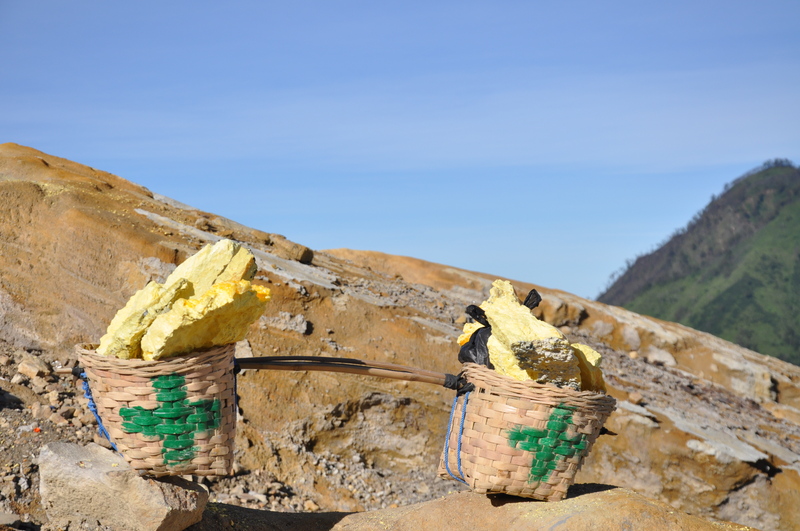 Ijen –> Probolinggo –> Mt. Bromo –> Surabaya. This trajectory involved 1 ferry, 2 jeeps, 3 cars and countless hours on the road so be prepared. 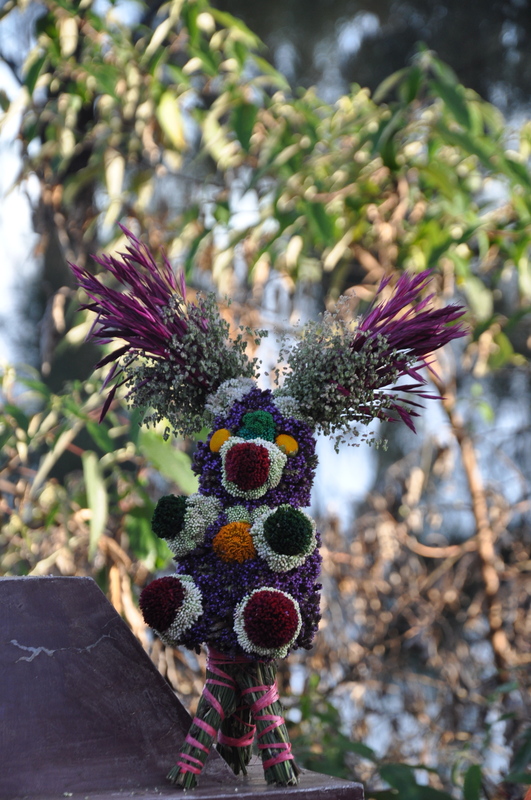 Day 1 – Bali I had been to Bali once before and it was love at first sight. I was so happy to be back on this charming island even if only for a day. 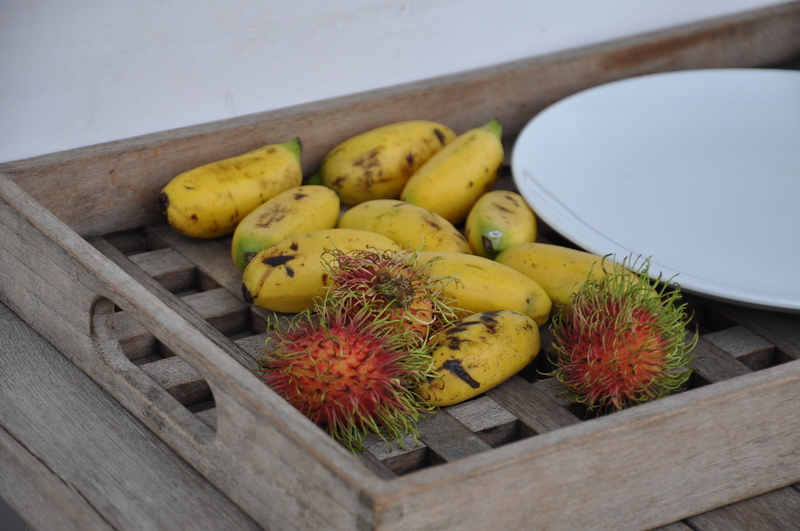 We didn’t have much time to explore choosing instead to wander around Seminyak Square for some shopping and a quick lunch at the buzzing plantation-style Bali Cafe before heading back to the hotel to take a car all the way to Gilimanuk for the ferry terminal. The car ride was about 5 hours long and very scenic but extremely tiring after a very late arrival to Bali the night before. 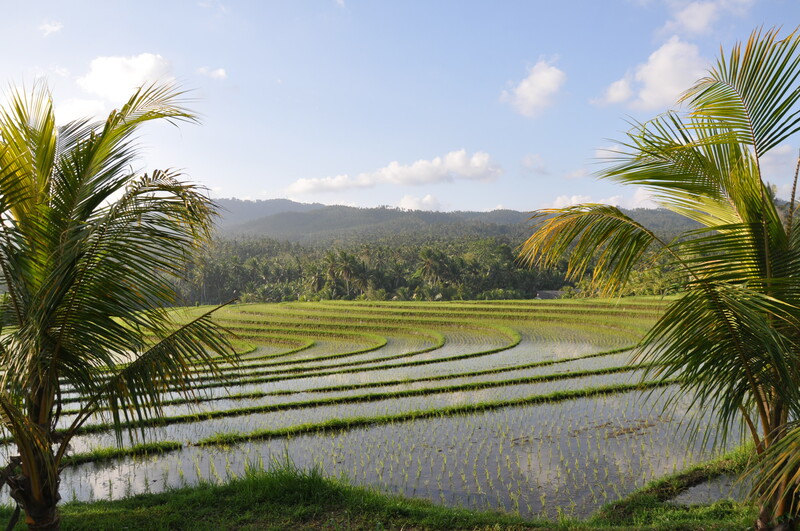 We still managed to do several stops to catch photos of the incredibly picturesque rice terraces. 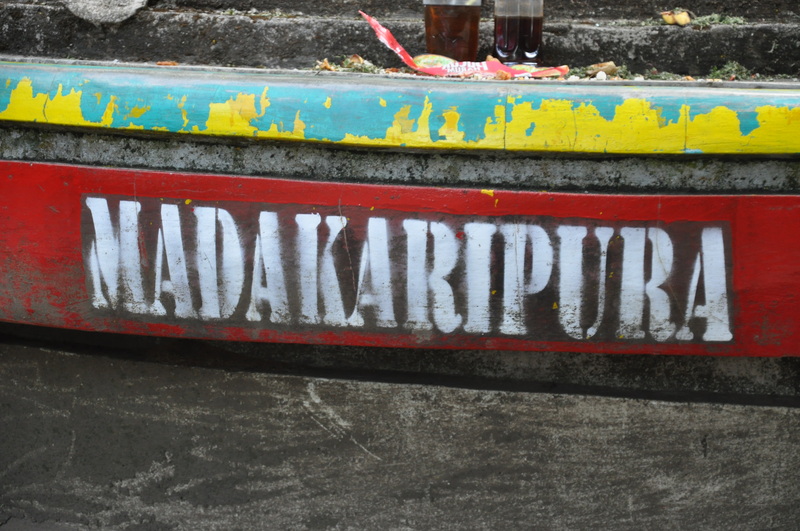 The ferries at Gilimanuk run every 15 minutes and arrive at Ketapang, basically Banyuwangi. Very convenient and comfortable in the sense that the ride was not very rocky; but this is by no means a comfortable journey by normal standards. There are more cars and trucks than people on this ferry and the boat is windowless and open. The seats resemble those joint plastic airport chairs that have worn away with time. We were prepared for adventure however and went along with the ride, exhausted and impatient to get to our hotel for a few hours of sleep before our 3am wake-up call. 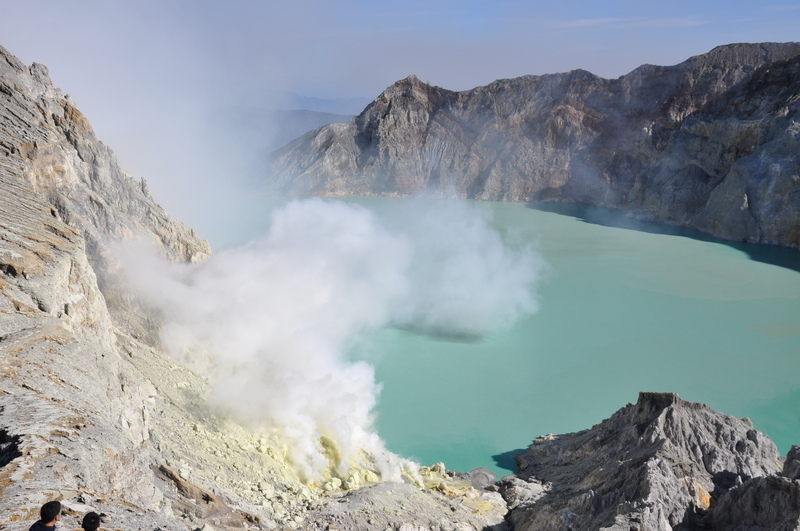 Day 2 – Banyuwangi & East Java First on our itinerary was Mt. 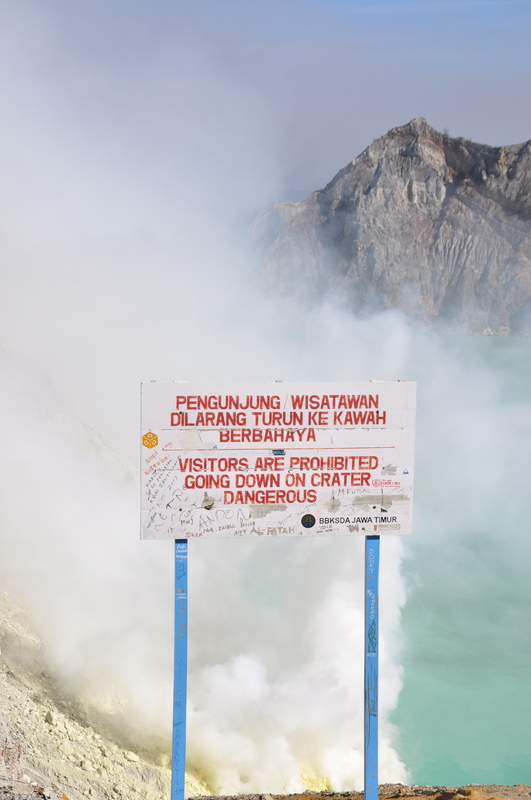 Ijen. We woke up to a 3am screeching alarm and got into a jeep for 1.5 hours to head up to the drop-off area on the mountain. The hike up was not easy. It is steep and can be slippery so it’s absolutely essential to be prepared. I’m an active person but I am by no means ultra-fit and I managed to do it with (some panting) but no issues. The trick is to pace yourself, something I struggle with constantly. Seeing Mt. Ijen was like watching the beauty and the beast. The view of the crater with the massive tufts of billowing smoke and the über green lake is something I will never forget. It was the ultimate reward after that tough early morning workout. We were exhausted but utterly mesmerized that we forgot our fatigue. Contrasting against that supernatural beauty is a harsh reality that you will witness as you commence your climb. 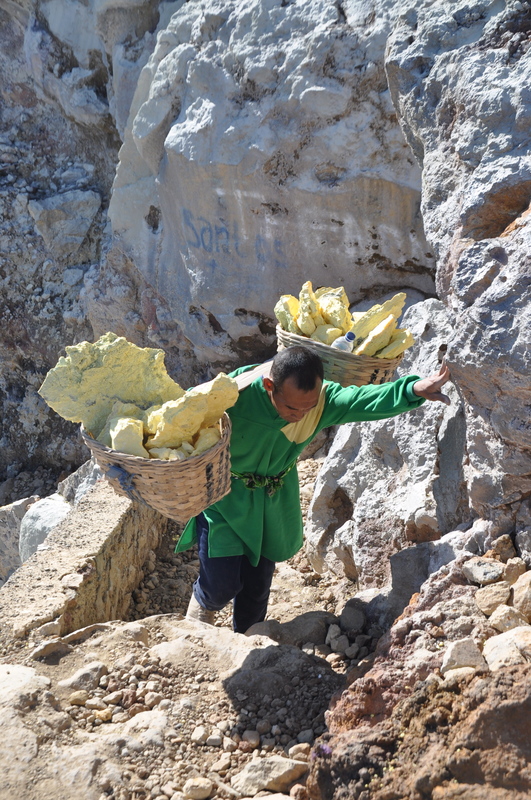 Scattered across the mountain slope are over 300 workers aged 27 and up, who make their way up and down the mountain multiple times a day carrying from 65-100 kgs of sulphur on their backs in basic wicker baskets. Once they have reached the crater, they descend down to its depths and manually hack off pieces of yellow sulphur with a stick. This is back-breaking work that pays virtually nothing. It was very painful to watch. We found ourselves asking why the responsible party was relying on such a backward method when surely there was a more efficient way to do this, saving those poor men from inhaling sulphur fumes day in and day out, protecting their backs and their knees from the pressures of the steep downward climb. It was heartbreaking to watch and it saddened me to know that what was beauty to us was misery to someone else. These men seem to have accepted their fates however, smiling at everyone who passes by and offering hello’s in basketful’s. Be warned, any photos of the men must be exchanged for a small tip. 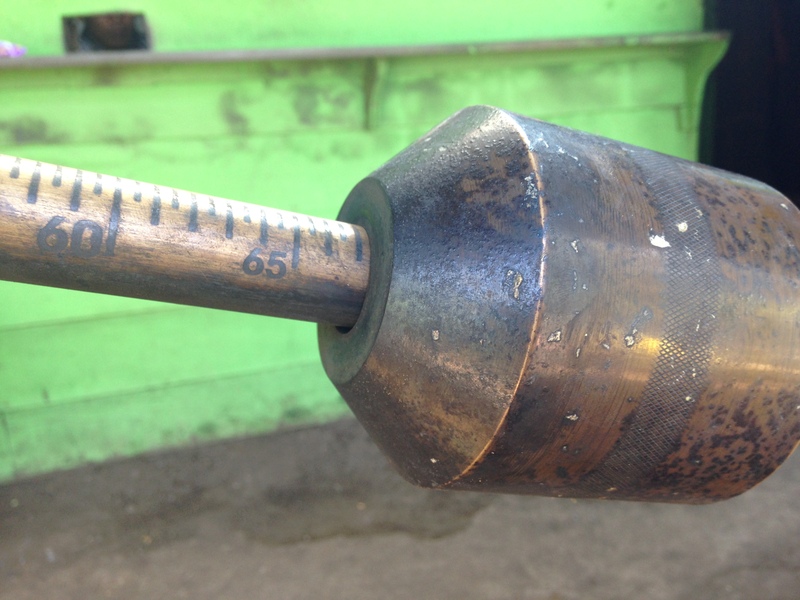 Something you will not flinch at once you see their sad states and appreciate their tremendous efforts. 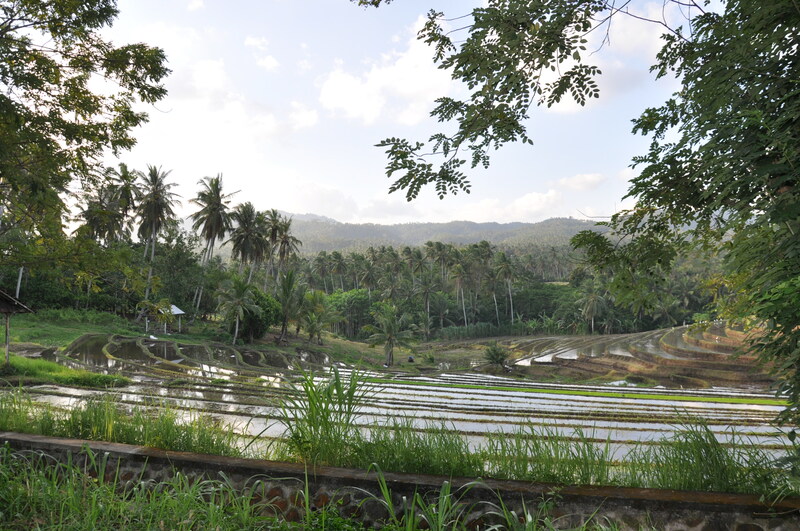 There is not much to do in Banyuwangi itself unless you choose to spend another day or two. 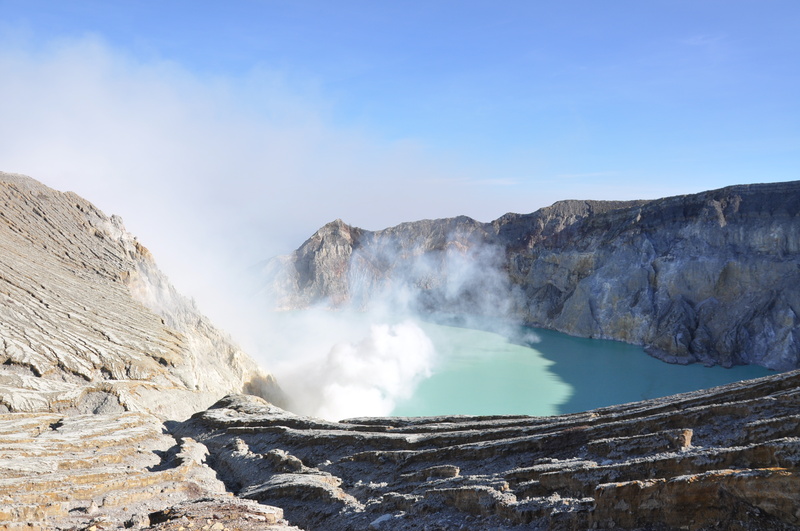 Around the city are a few options that require some driving: one is Tabuhan Island, which is situated 20 km from Banyuwangi. This is apparently great for scuba diving and snorkelling. 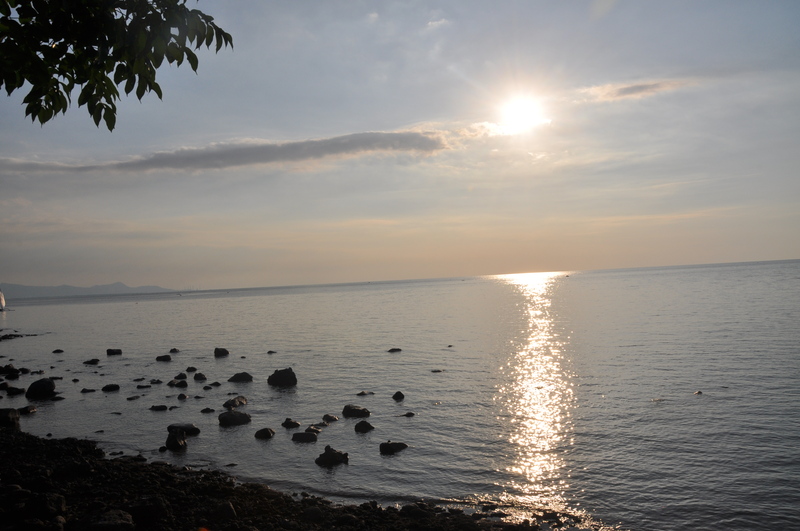 Sukamali Turtle Beach is another of them if you think you could enjoy an untouched sandy beach and turtle sightings. Unfortunately we had time for neither. I regretted not being able to do this as witnessing the laying of turtle eggs is something I have heard is life-changing and is something I would love to experience. Nonetheless, we were back at the hotel at 11am, just in time to pack, check out and have lunch before hopping back into the car for a 6 hr drive! It sounds worse that it was! No really. The first four hours were actually quite enjoyable because the route was extremely scenic and we stopped for photo breaks, snack breaks and to stretch our legs quite often. 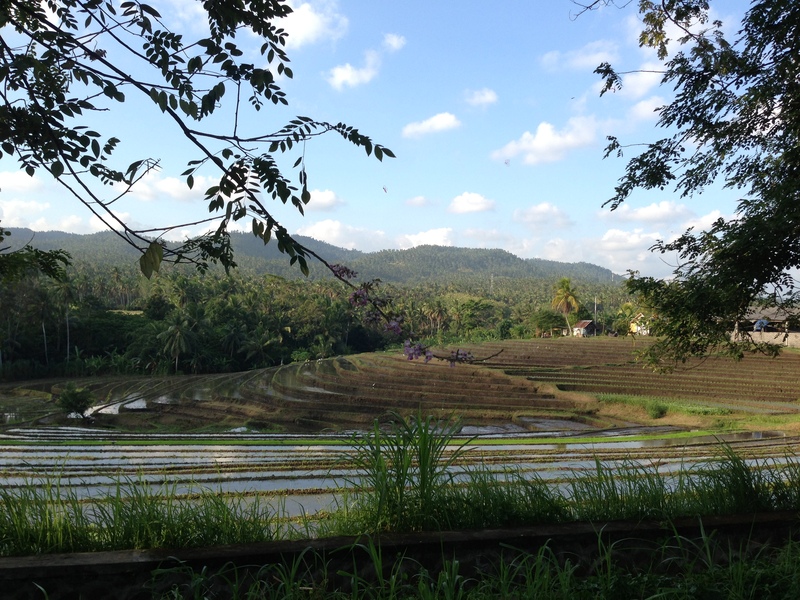 Rice paddies, ocean views and lush plains dwarfed by mountains and volcanos kept our eyes and our minds entertained as we drove along the coast to get to Probolinggo from where we would begin our steep ascent to Mt. 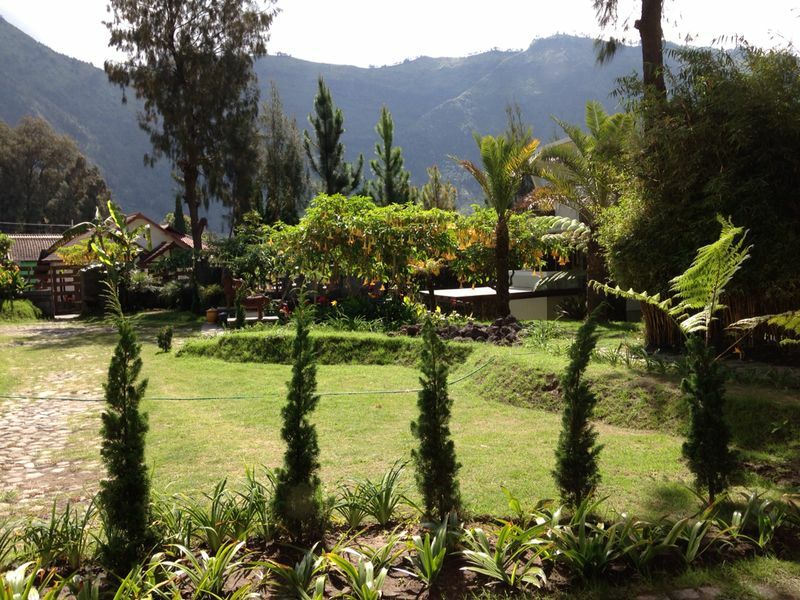 Bromo, our home for the night. The last two hours I will not lie were utter torture, mainly because the sun had descended throwing us into total darkness. Our impatience soared as we went up the mountain one slow bend at a time, for 45 long minutes until we finally stepped out to be met by chilly winds and fresh mountain air. A godsend after being in Asia for just 2 months. 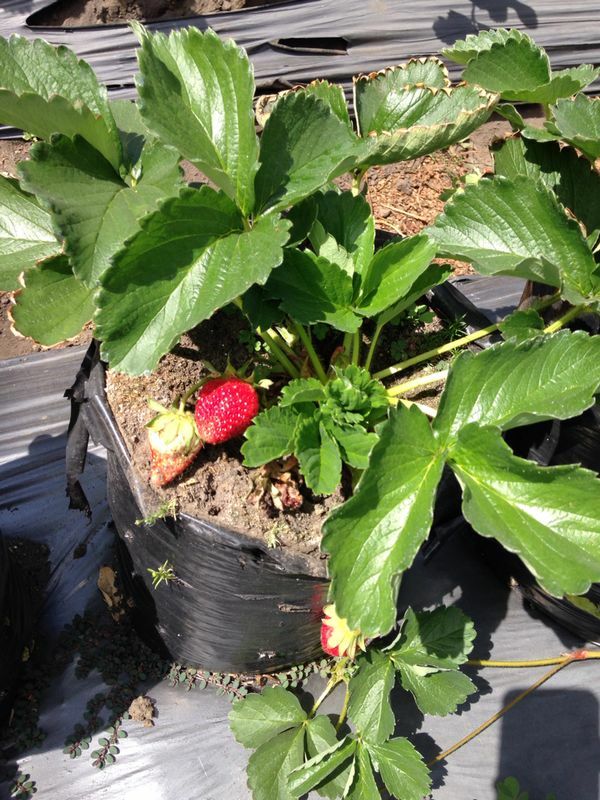 Day 3 – Mt. Bromo & Surabaya After experiencing our first active volcano at Mt. Ijen, we were on a high. We couldn’t wait to get to the 2nd one even if we knew we had another 3am wake-up call waiting for us. 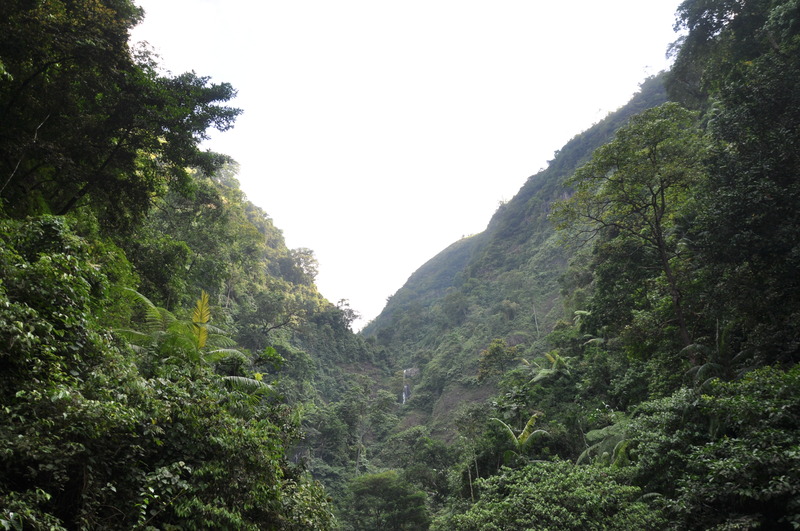 As I mentioned above, the road from Banyuwangi to our hotel on Mt. Bromo was very long. 6 hours long to be precise. Somehow we made it thanks to copious amounts of junk food and numerous stretching breaks. The fact that the scenery along the way was stunning didn’t hurt either. 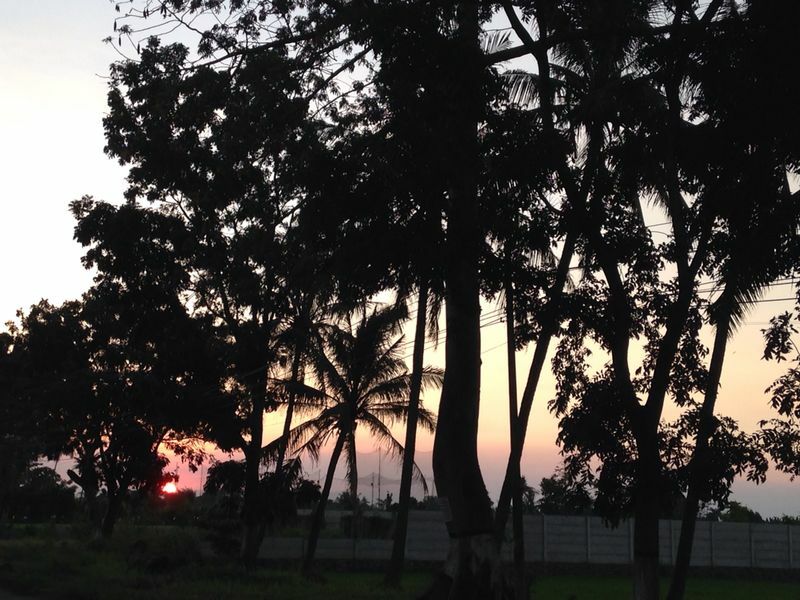 To watch the sun descend on East Java is like watching an artist at work. The sky was a canvas of bold splattered colors that were utterly magical. There is so much beauty in nature. What Mt. 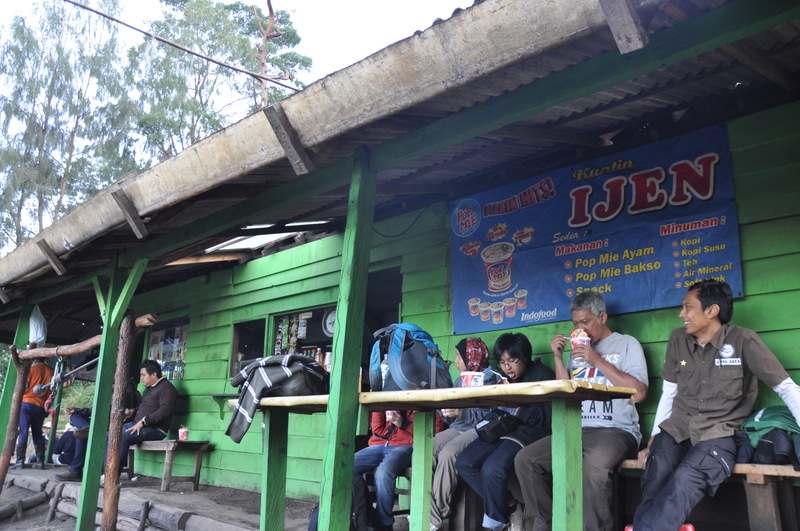 Ijen lacked in ease, Mt. 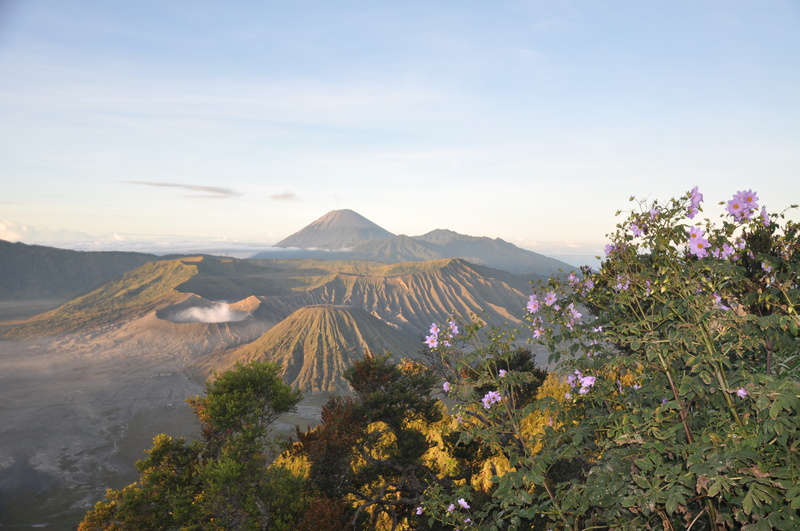 Bromo made up for. Likewise what Mt. 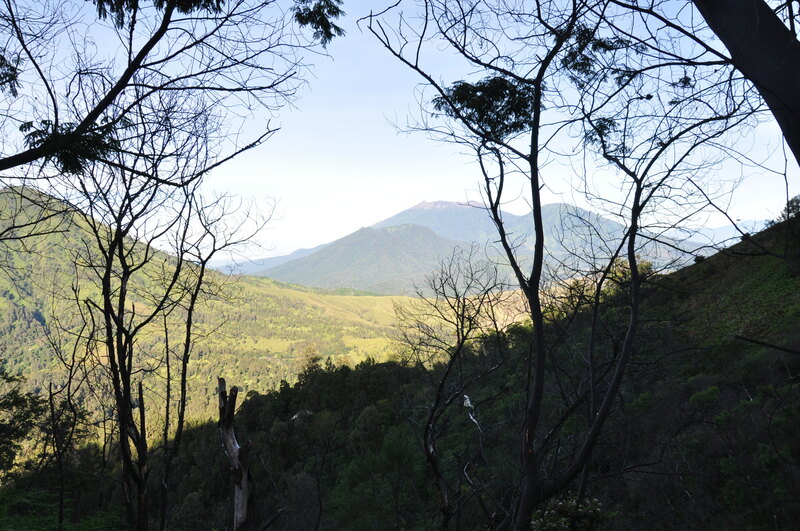 Ijen offered in peace, Mt. 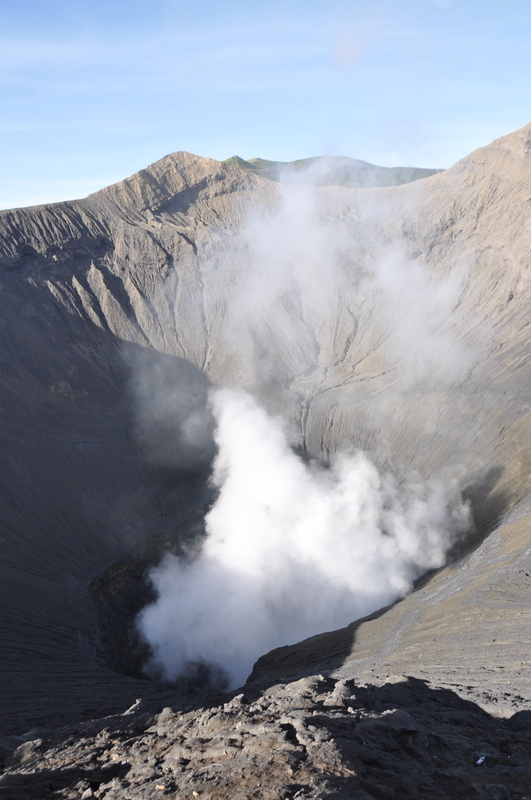 Bromo lacked in bucketfuls. 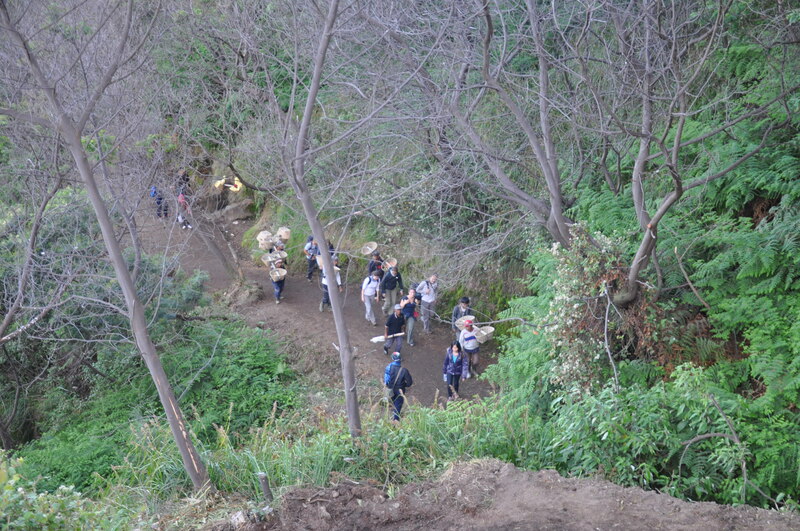 In contrast to the peaceful and calm hike up we experienced at Mt. 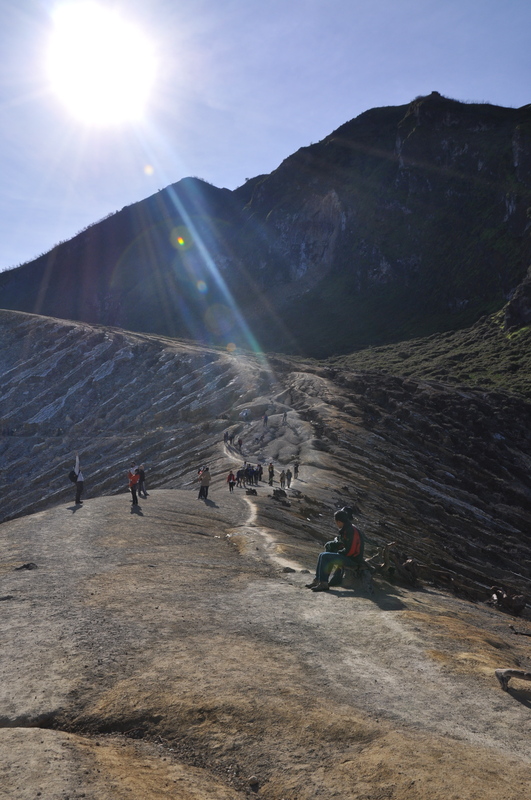 Ijen, Mt . 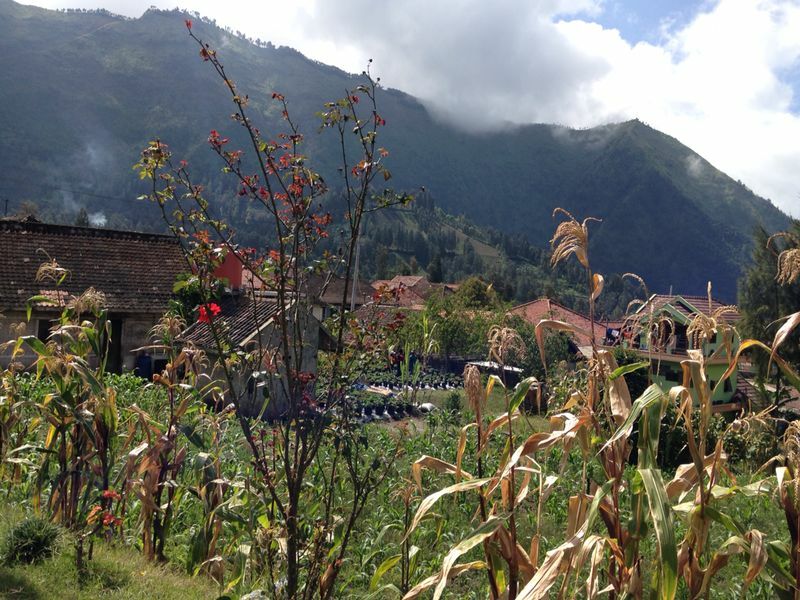 Bromo felt like a vegetable market. It was absolutely jam-packed with thousands of people, mainly locals. Being more central and more accessible to more populated surrounding cities makes Mt. 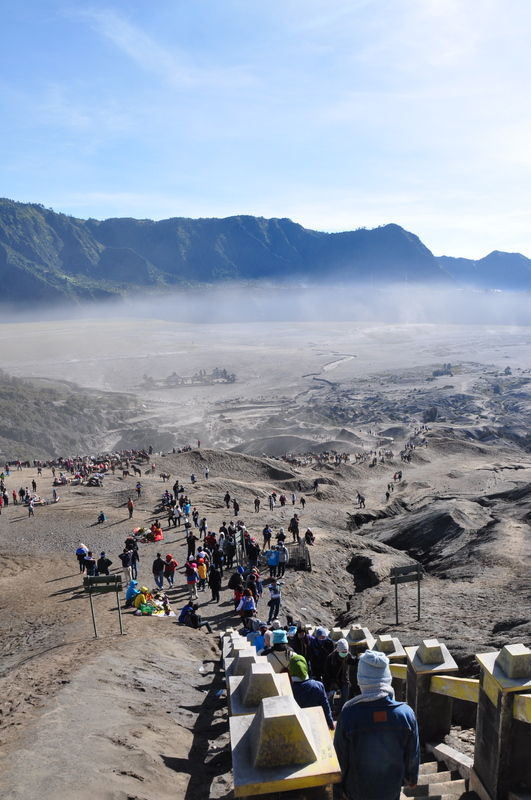 Bromo the more popular of the volcanos. Unlike Mt. Ijen, and thanks to the excellent location of our hotel, we had a mere 15 minute drive at 3am to get to the drop-off point. The road was far bumpier than that we experienced the day before and suffice it to say we were happy we hadn’t eaten breakfast. It was like experiencing an Asian massage on the rough. We walked up towards the observation point at the peak of Mt Penanjakan. 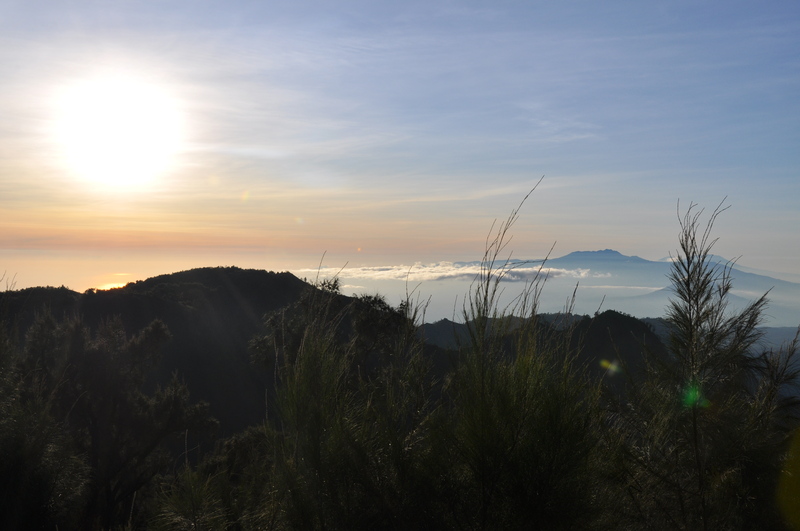 This is directly facing Mount Bromo and is the best spot to catch the sun rising above the cluster of mountains. This was a 15 minute walk and we were glad to have the 5 layers we were wearing. It was cold and slightly windy. 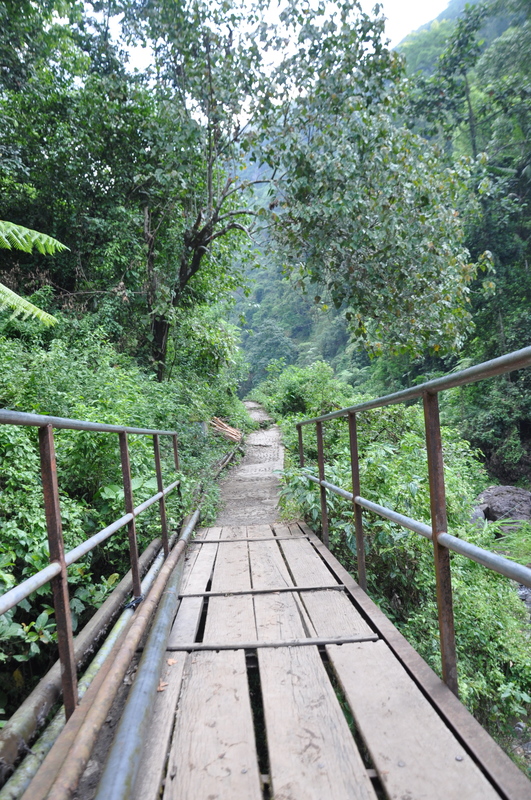 The walk up was torturous despite its relative ease and its briefness. 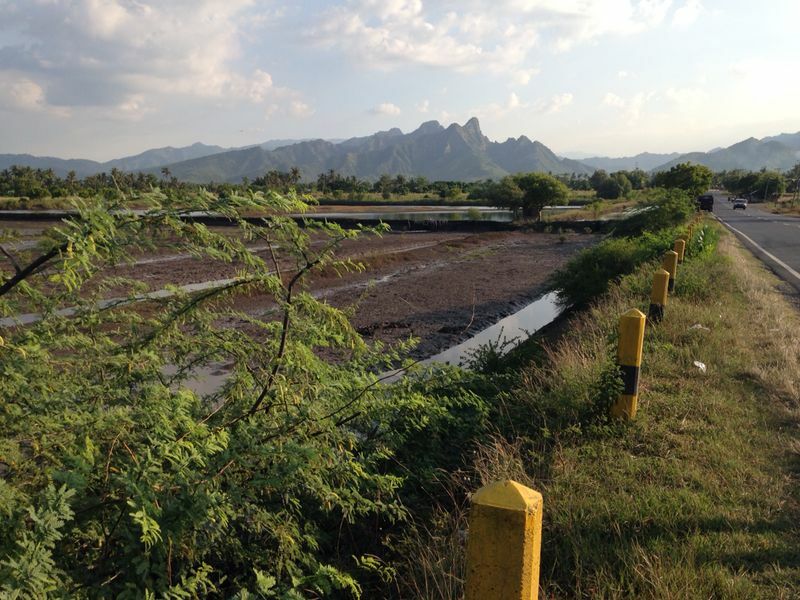 The road was choking on motorbikes, jeeps and a noxious combination of cigarette smoke and motorbike smoke. Not my kind of wake-up call! 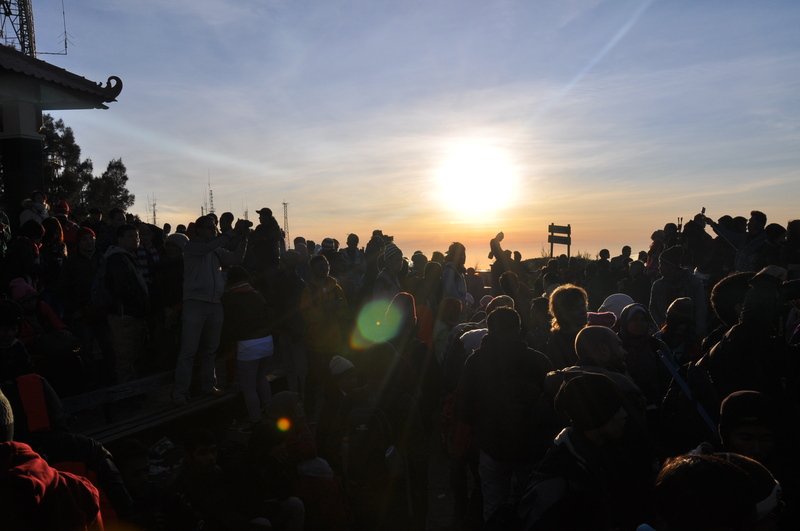 Still, we made our way up to the observation deck to be greeted by a crazyyy crowd. We literally had to squeeze our way through to find a decent spot where we could wait for the sunrise and have a sense of personal space where no-one would be breathing down our necks. This hotel garners the highest recommendations online for the area and its well deserved. It is expensive by Indonesian standards but I use this word quite loosely because Indonesia is ridiculously cheap. The grounds of this property are huge and very lush and sit on the beachfront even though the sandy shore is so narrow you can see Bali across its waters. The rooms were roomy and simple but sufficient and the staff was just amazing. Evenings are calm and you have a sense of being far away from everything. We walked around the property at night and saw the starriest sky ever on our evening there. Arriving at the ferry terminal was an experience for us because it was impossible to find a taxi to drop us off at the hotel. There were plenty of moto-taxis (motorcycle cabs) but this did not interest us even though we had tiny pieces of luggage. We ended up hitching a ride with a small lorry! lol To this day we have no clue whether or not he was a cab but we were just sooo happy to see something on four wheels. We hopped onto the back of the lorry (covered thankfully!) and he got us safely onto hotel grounds. Ask your hotel to book a ride for you in advance. Contrary to what you may think, the mountain peak is not as cold as you may imagine. We were a little overdressed for Mt. 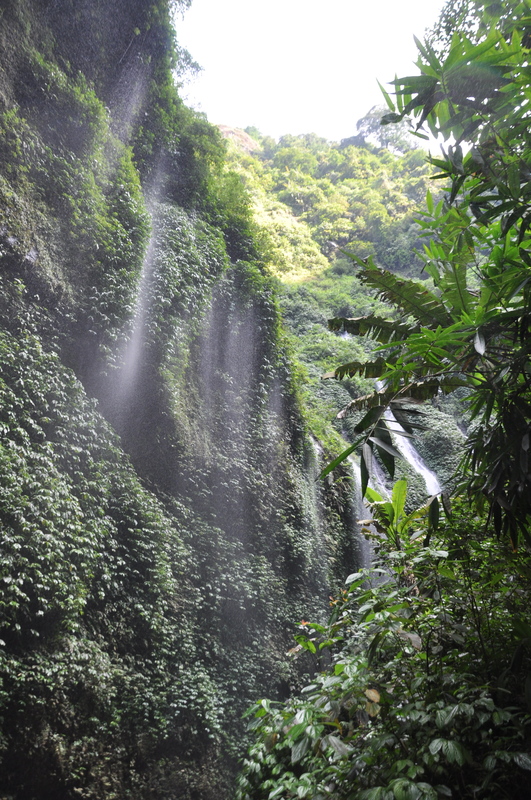 Ijen. You need a good wind proof coat for the start of your climb as the temperature is certainly cooler before the sun comes up and before you begin the ascent. It gets warm quite quickly however especially because of the effort you are making to hike up. I found myself shedding layer after layer as we rounded every bend. It is about 20-25C at the top. Maybe 15-17 at the parking lot level. This property’s name does not do it justice. One hears such a comical name and assumes nothing that could match the reality we experienced. This is a beautiful hotel reminiscent of a Swiss chalet in the Alps and the views and greenery may just as well compete with their Swiss counterparts. This is a stunning part of the country. 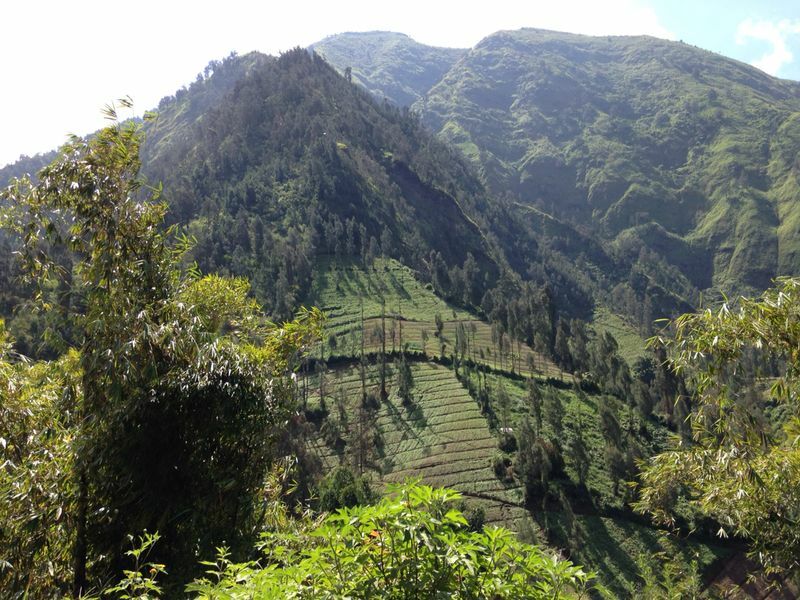 The hotel was located on the mountain in the Tengger Highlands where mountains dwarf little villages and fields upon fields of produce that cannot grow in mainland Indonesia due to the climate thrive here: like strawberries and onions to name a few. The owner of this property is a celebrity in his neighborhood thanks to his philanthropic nature and his renowned skills as a photographer. 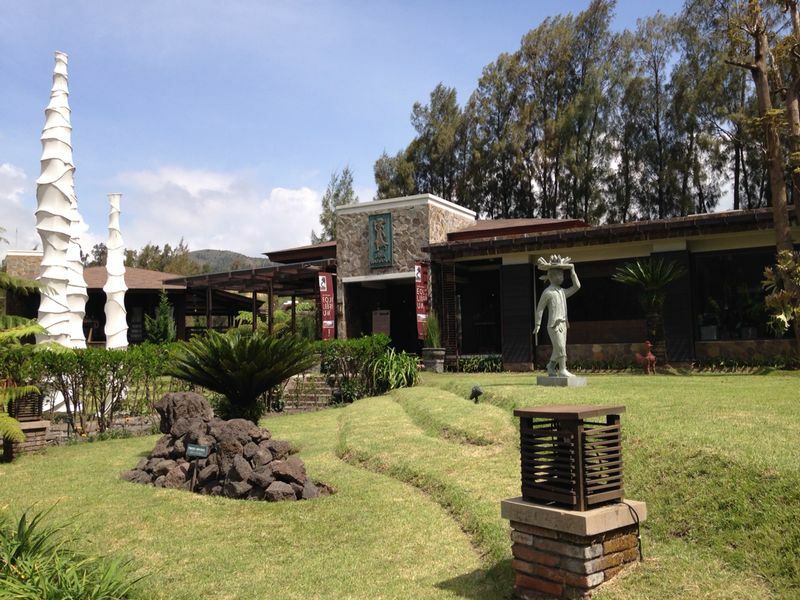 His photos of people from the village as well as of the volcanoes are all over the property and lunch or breakfast on the terrace of the main restaurant is an absolute must-do. This is the best hotel in the area. Don’t stay anywhere else. It is expensive by Indonesian standards but, again, I use this word with a lot of bias because Indonesia is ridiculously cheap. It is not at all expensive in the grander scheme of things and is worth every penny if only for its proximity to Mt. Bromo. It can get quite cold at that altitude so pack well. We spent the 2 days before our trip in a mad scramble to find warm clothes. It’s not easy in Singapore! Our trick was to layer but its key to have a fleece and a light sports jacket at least for the first part of the trip. It gets warmer once the sun comes out and you are at the base of the crater but still it is no where as warm as mainland. It’s refreshingly crisp. We found that our Columbia insulated jackets were just perfect. Sleep early. This sounds like a no-brainer but it’s a must if you want to wake up feeling rested and enjoy the experience. It would be miserable to have come all the way for the volcanos and be grumpy about the 3am wake-up.